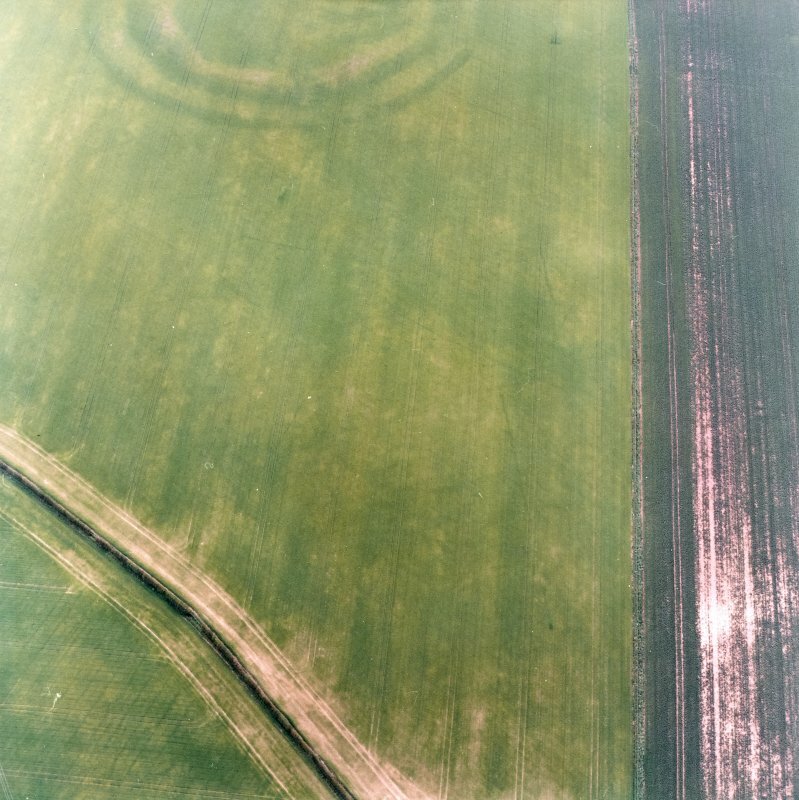 Oblique aerial view centred on the cropmarks of the field boundaries and cropmarks with fort adjacent, taken from the NNW. 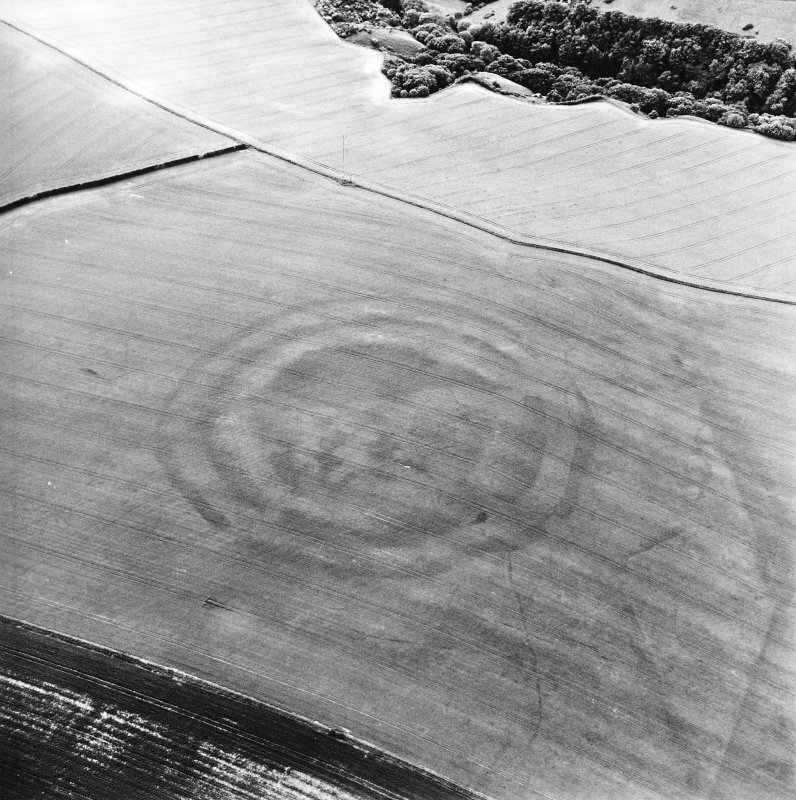 Oblique aerial view centred on the cropmarks of the field boundaries and cropmarks with fort adjacent, taken from the NNE. 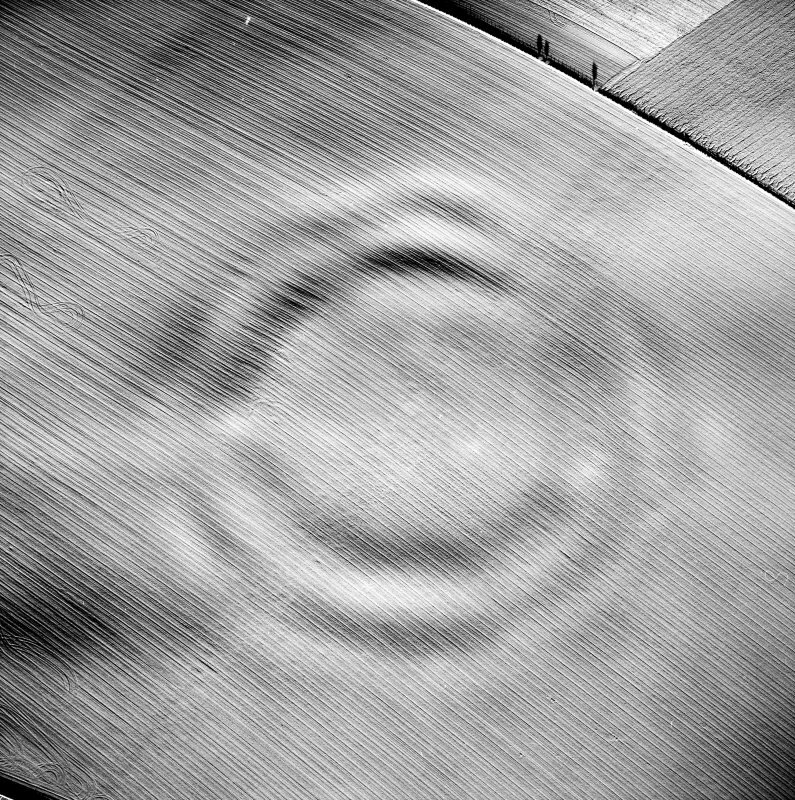 Oblique aerial view centred on the cropmarks of the field boundaries and cropmarks with fort adjacent, taken from the SW.
Oblique aerial view centred on the cropmarks of the fort with field boundaries and cropmarks adjacent, taken from the S.
Oblique aerial view centred on the cropmarks of the fort, field boundaries and cropmarks, taken from the WSW. 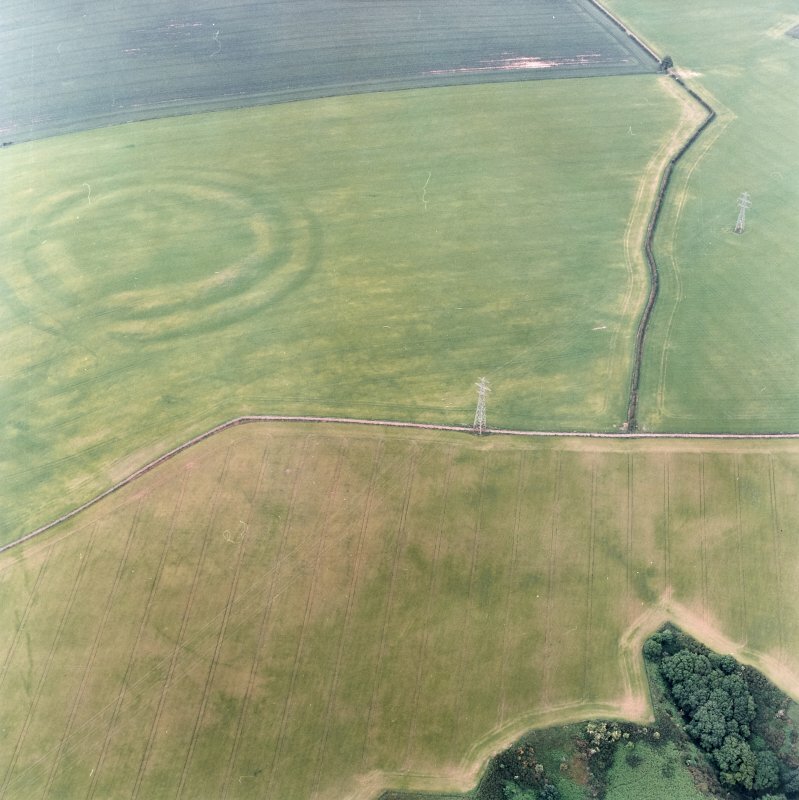 General oblique aerial view of the soilmarks of the fort of The Chesters, Spott, with the coast in the distance, taken from the SW.
Oblique aerial view centred on the cropmarks of the fort with field boundaries and cropmarks adjacent, taken from the ESE. 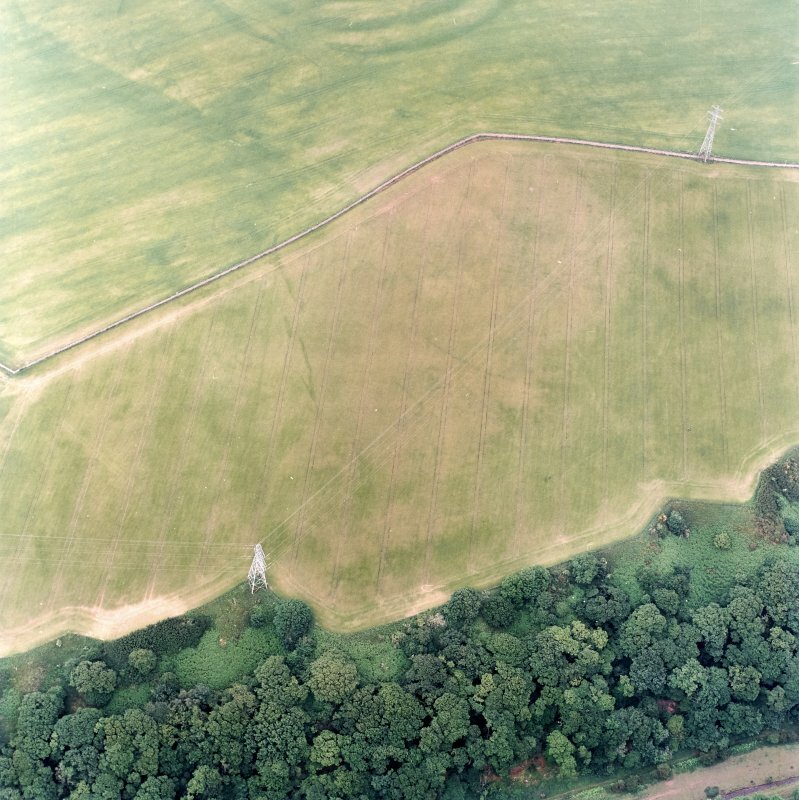 Oblique aerial view centred on the cropmarks of the field boundaries and cropmarks with fort adjacent, taken from the SSW. 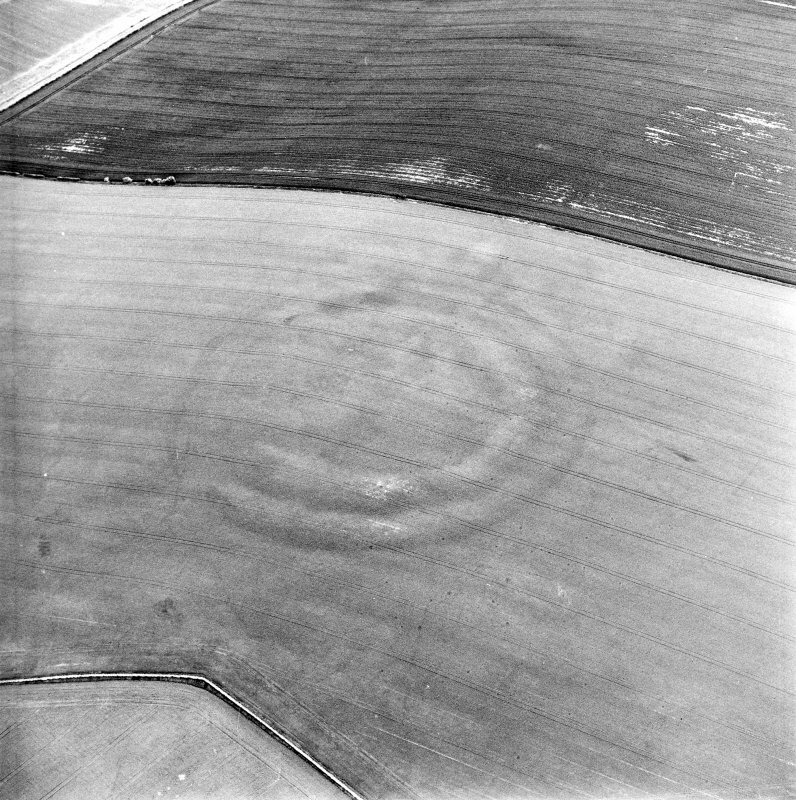 Oblique aerial view centred on the cropmarks of the field boundaries and cropmarks with fort adjacent, taken from the SE. 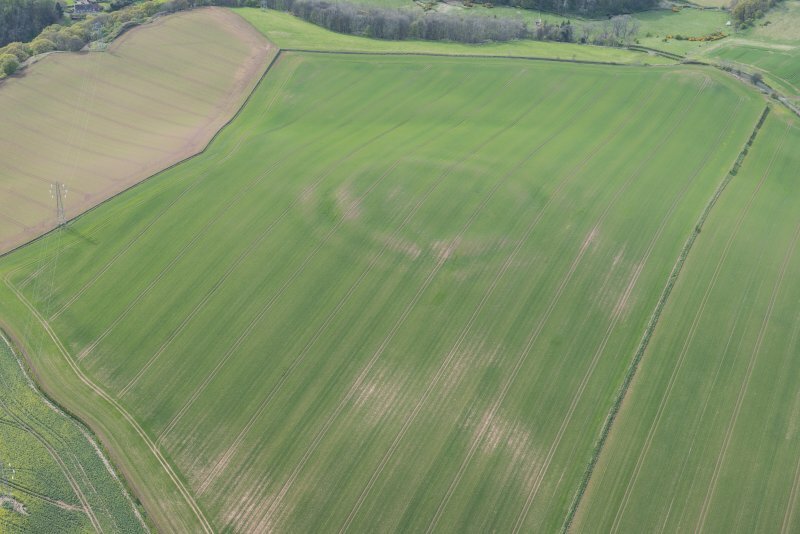 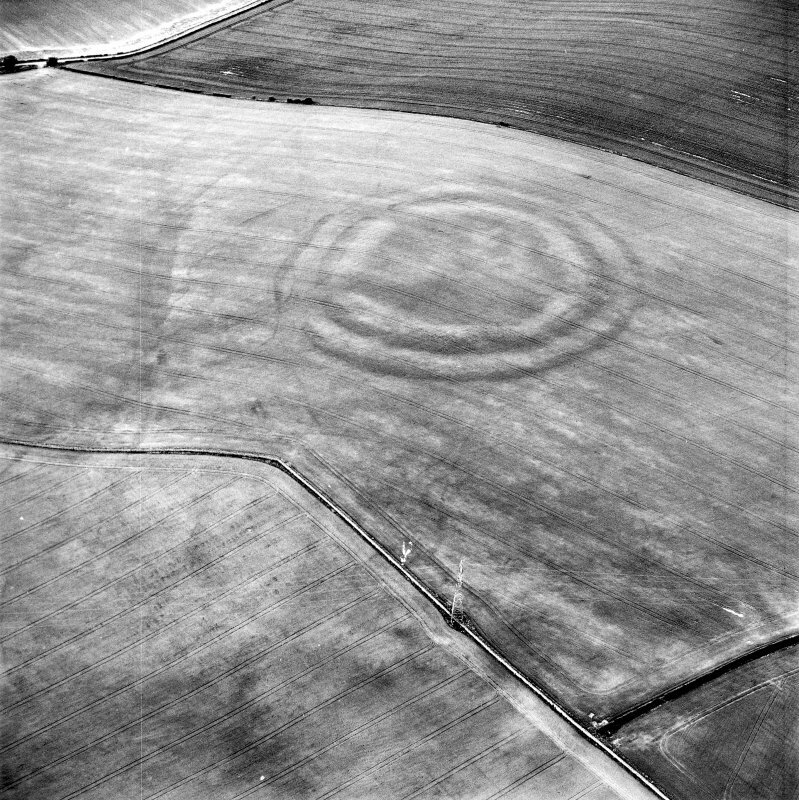 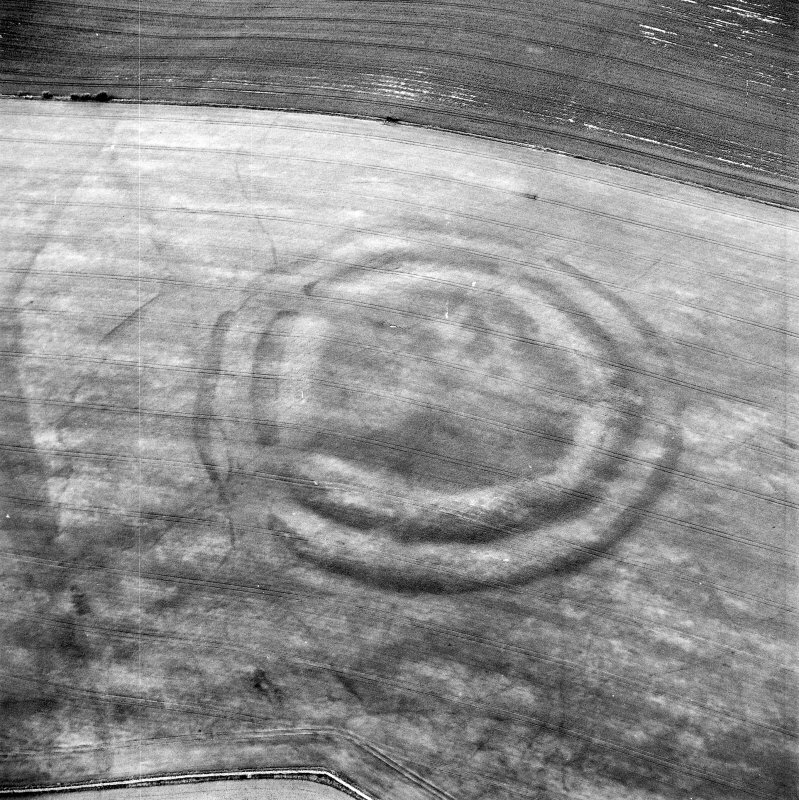 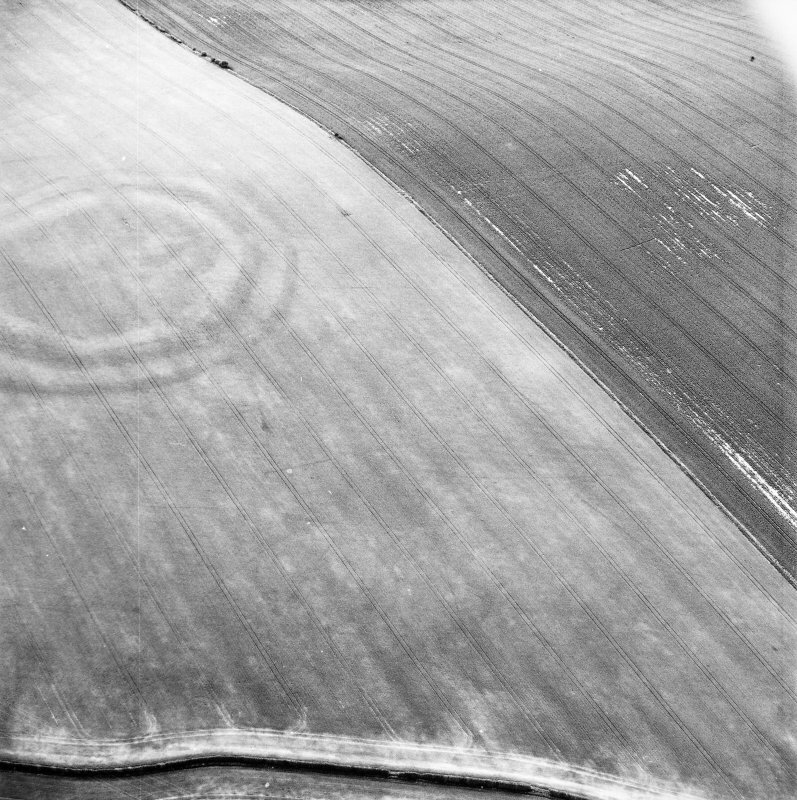 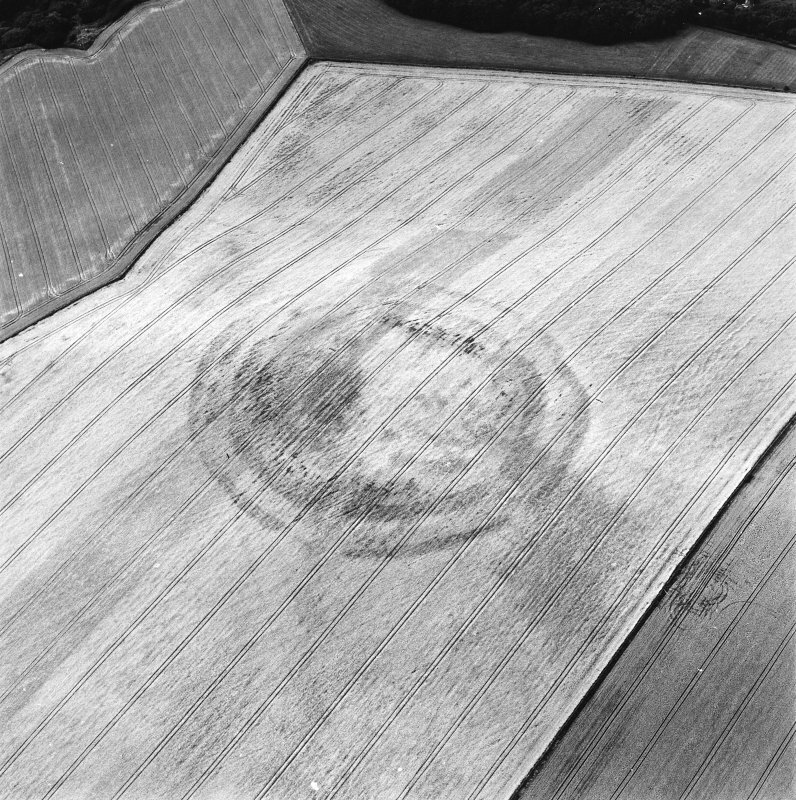 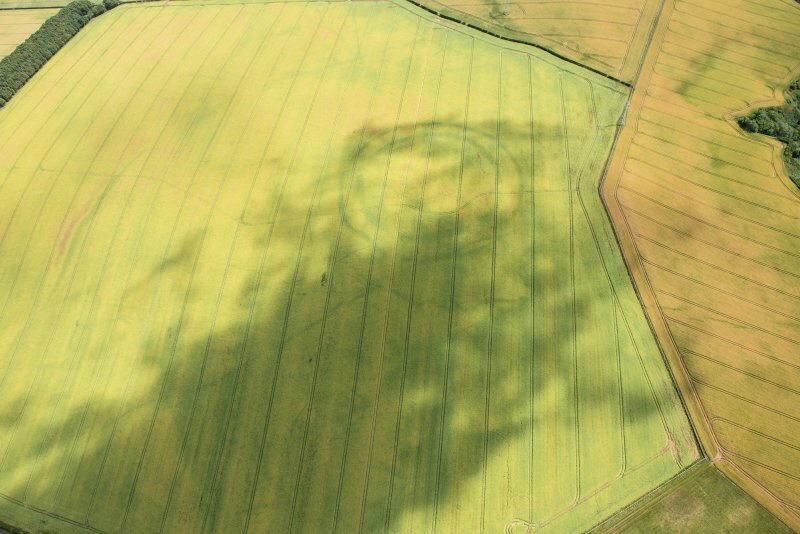 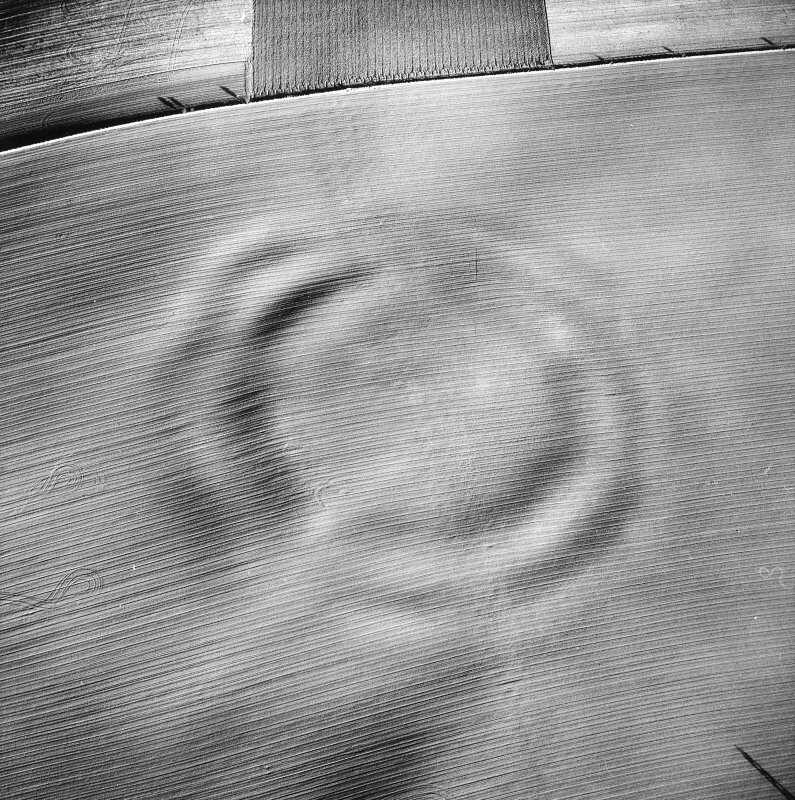 Oblique aerial view centred on the cropmarks of the fort, taken from the SSW. 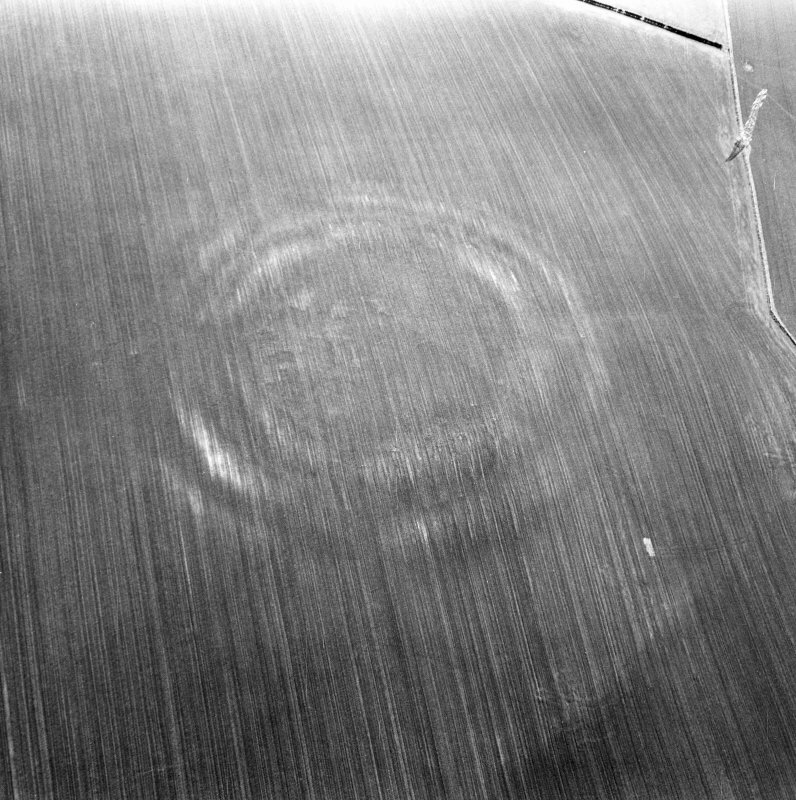 Oblique aerial view of the cropmarks of the fort at The Chesters, Spott, looking S.
General oblique aerial view of the soilmarks of the fort of The Chesters, Spott, taken from the ESE. 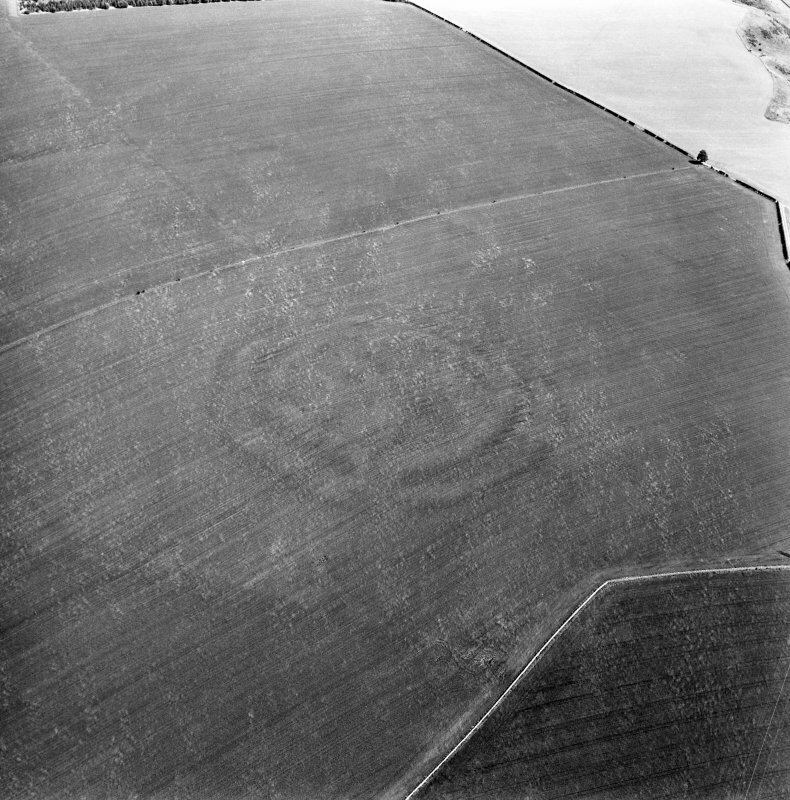 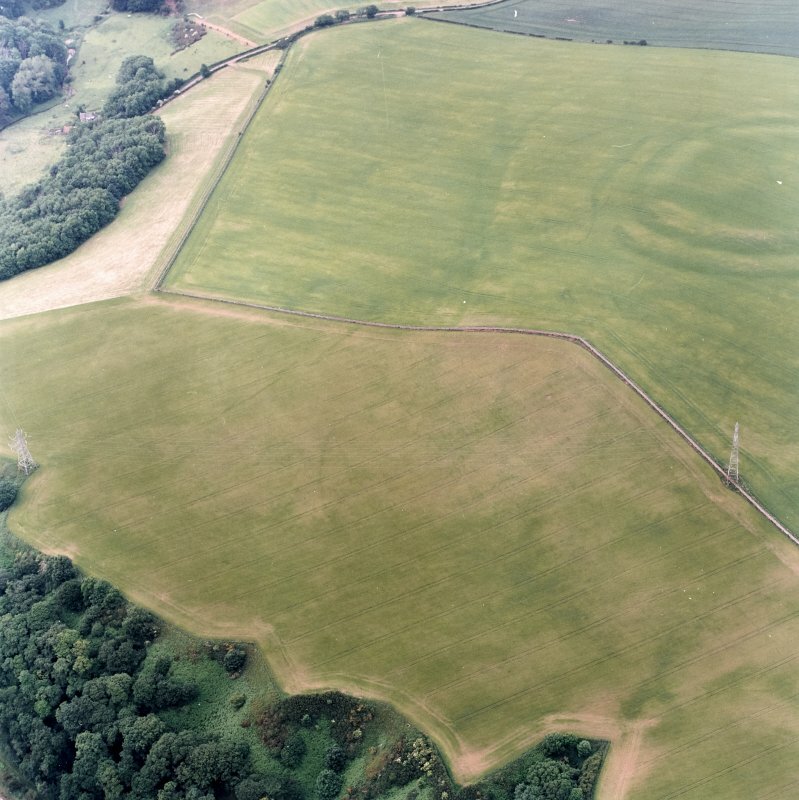 Oblique aerial view of the soilmarks of the fort of The Chesters, Spott, taken from the SE. 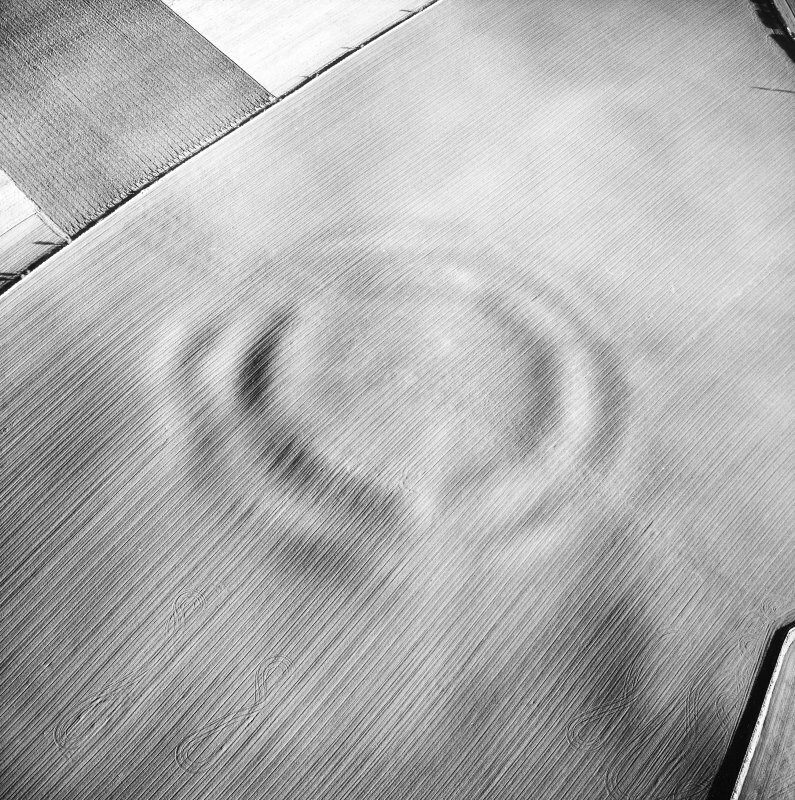 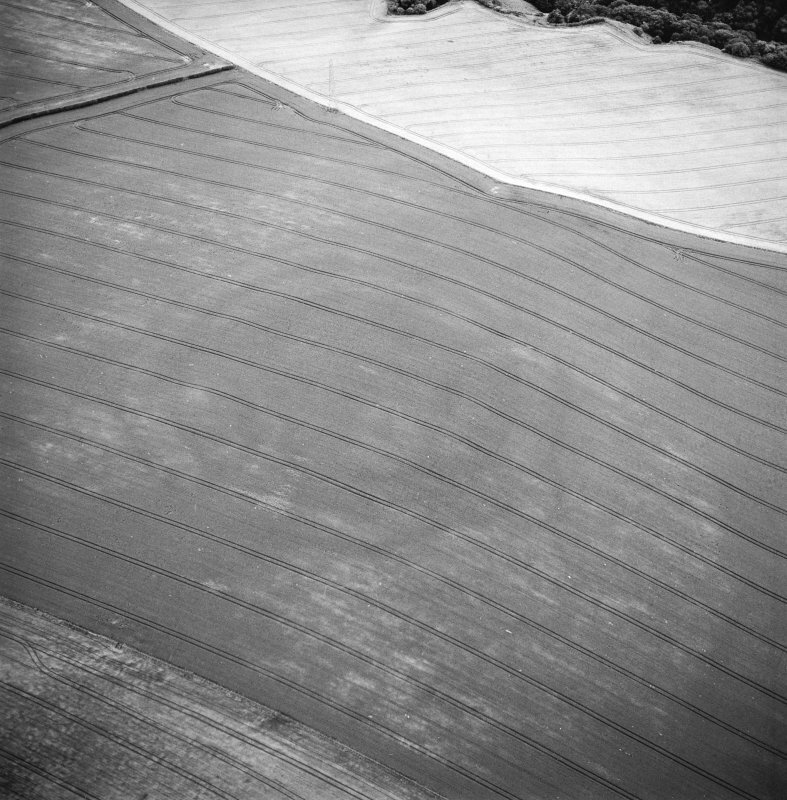 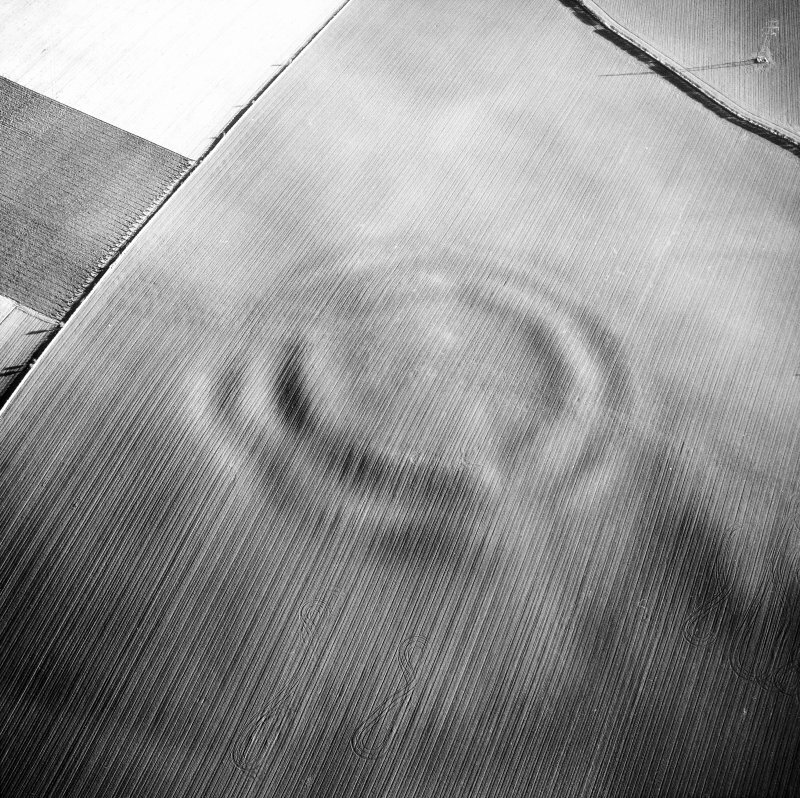 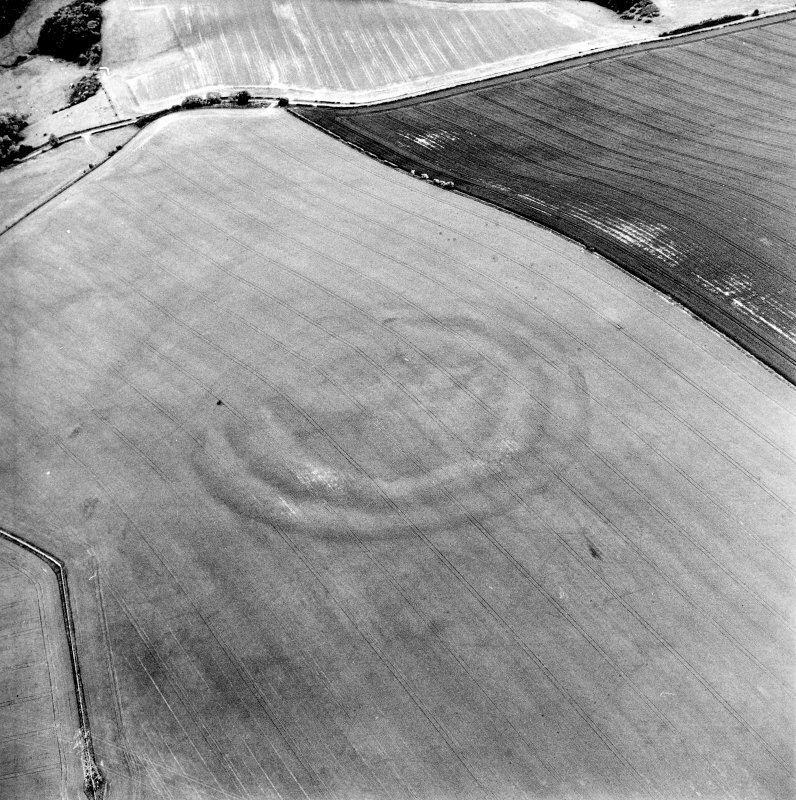 Oblique aerial view centred on the cropmarks of the fort, taken from the WNW. 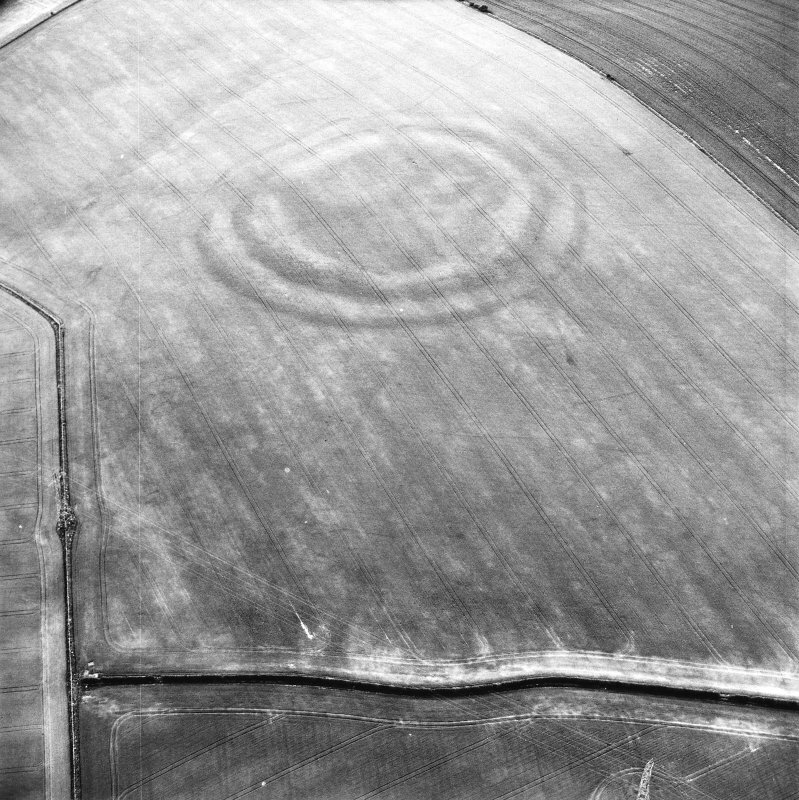 Oblique aerial view centred on the cropmarks of the fort, taken from the ESE. 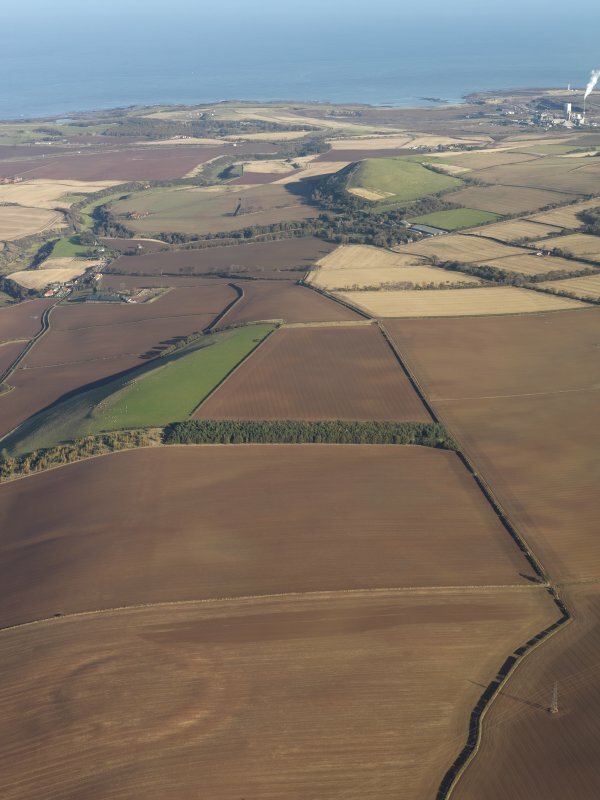 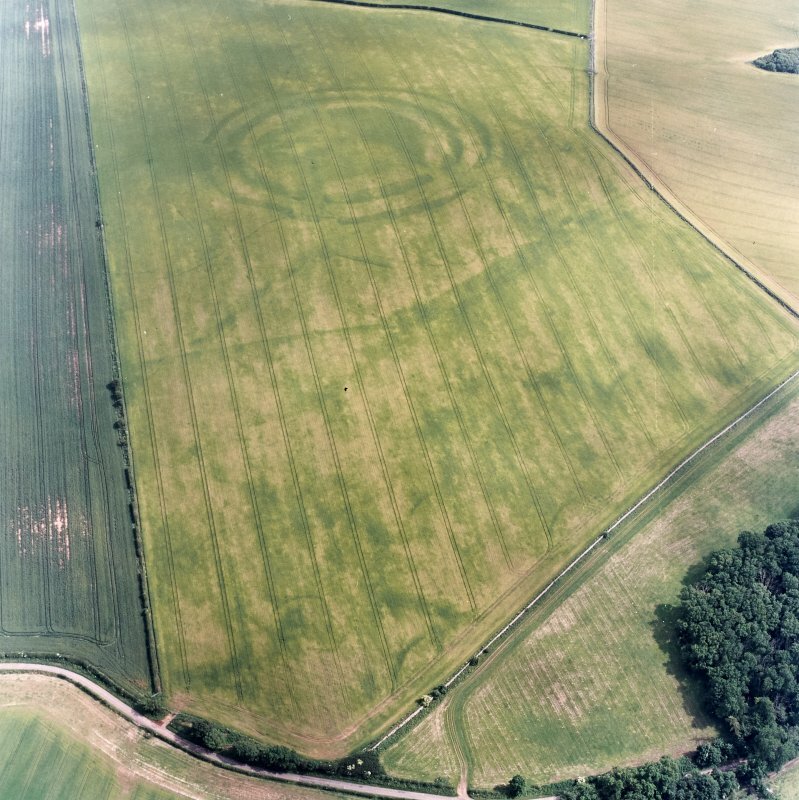 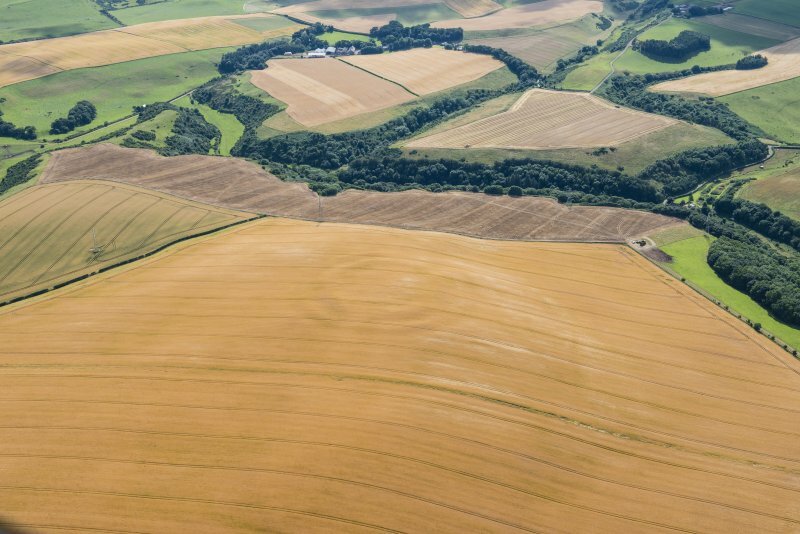 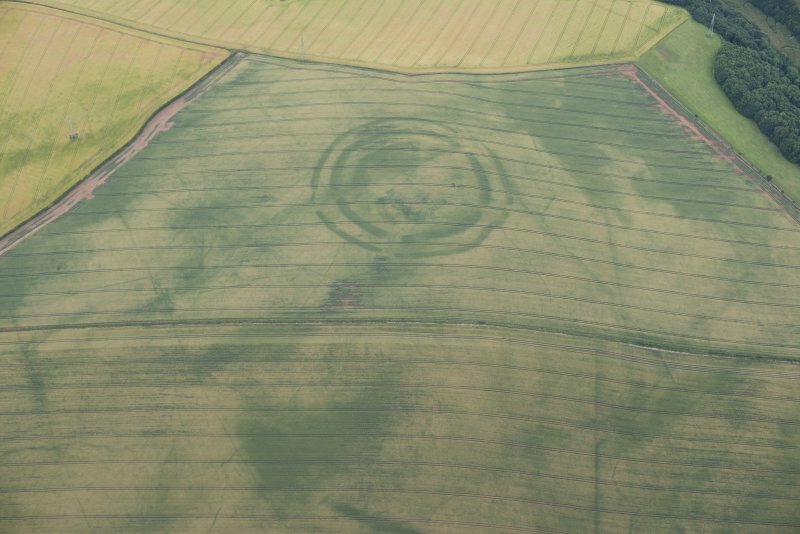 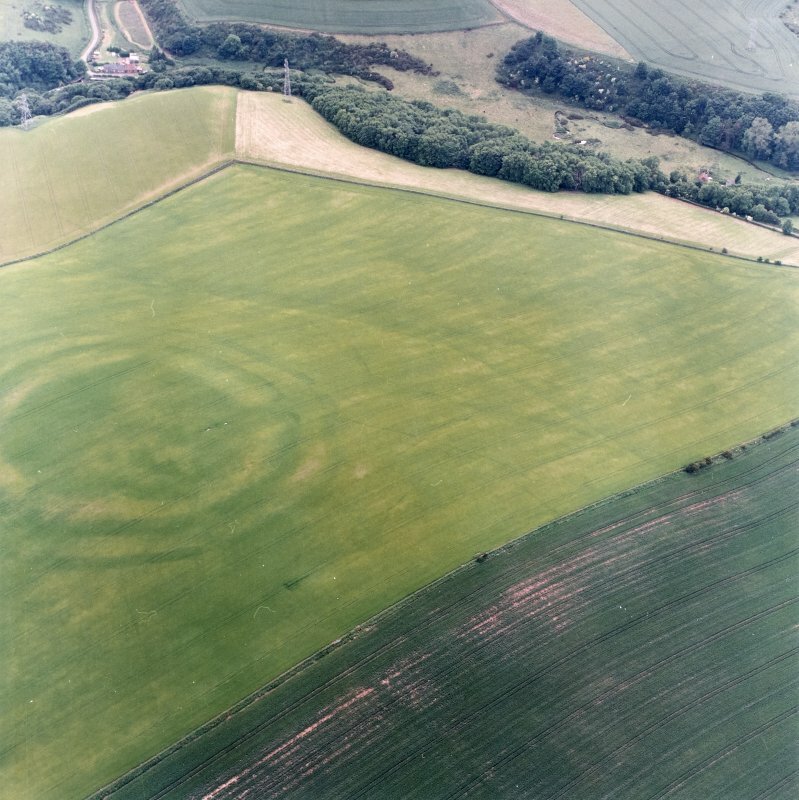 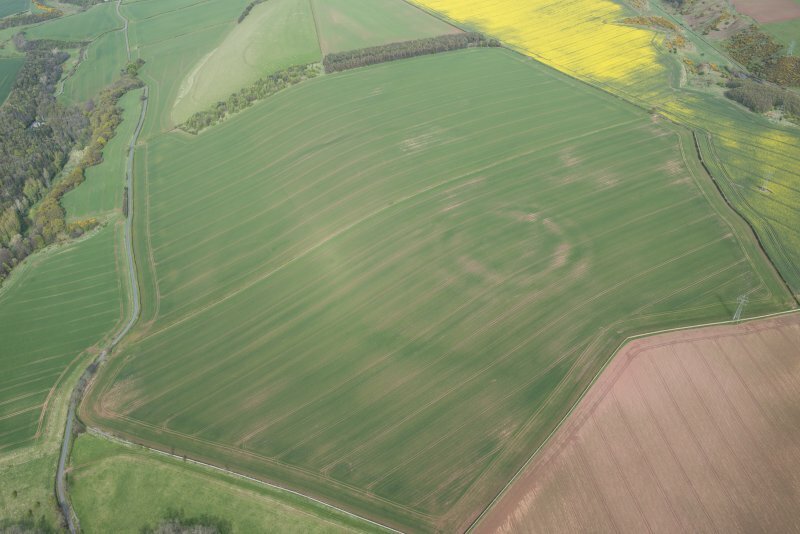 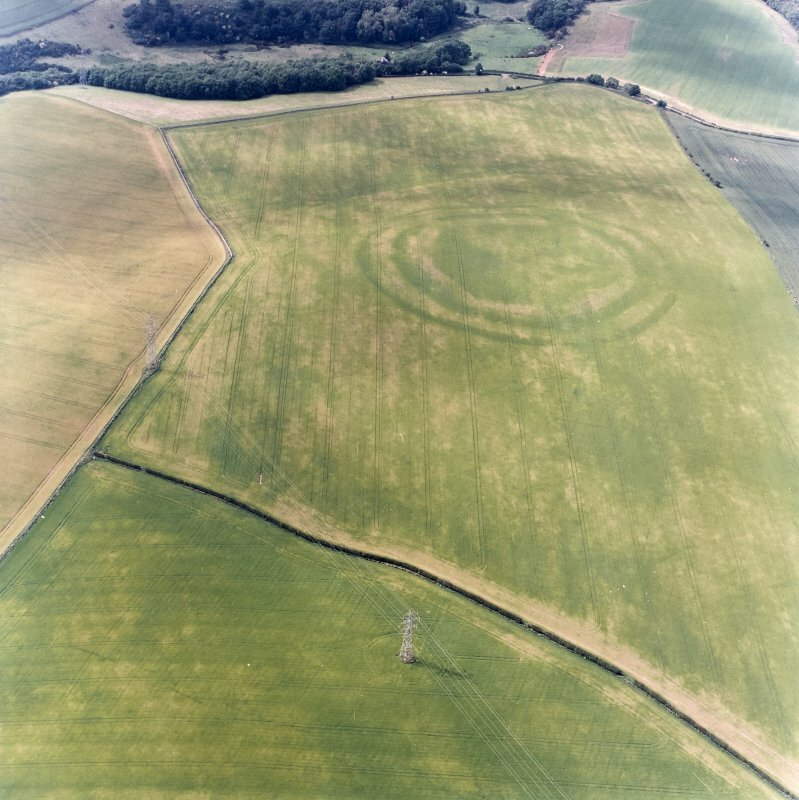 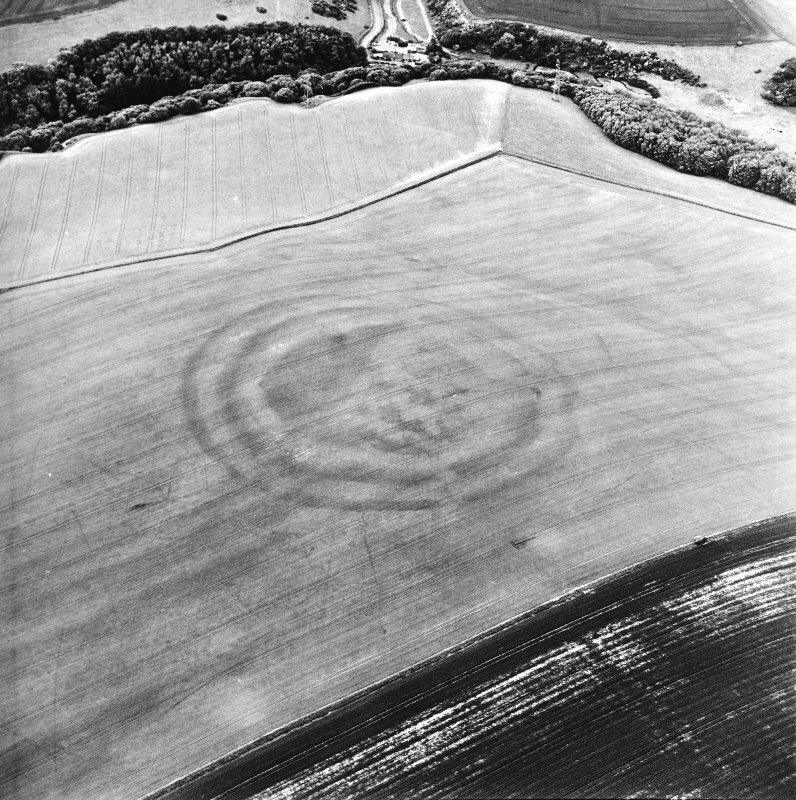 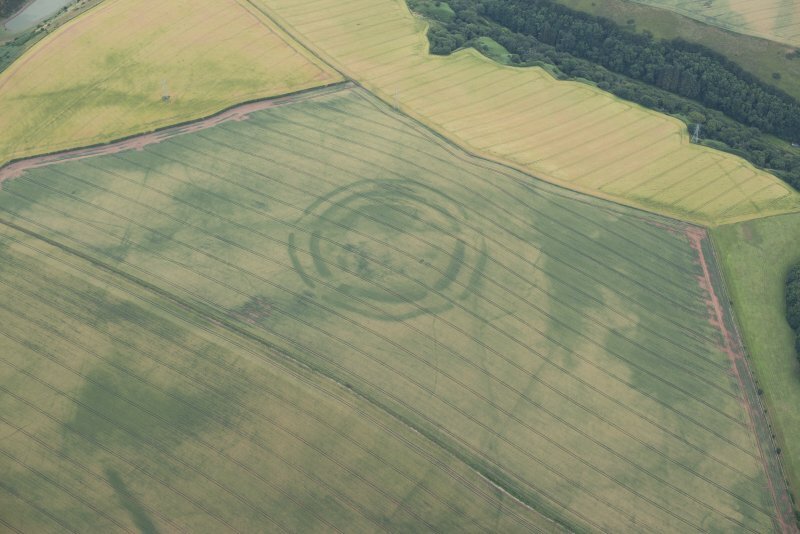 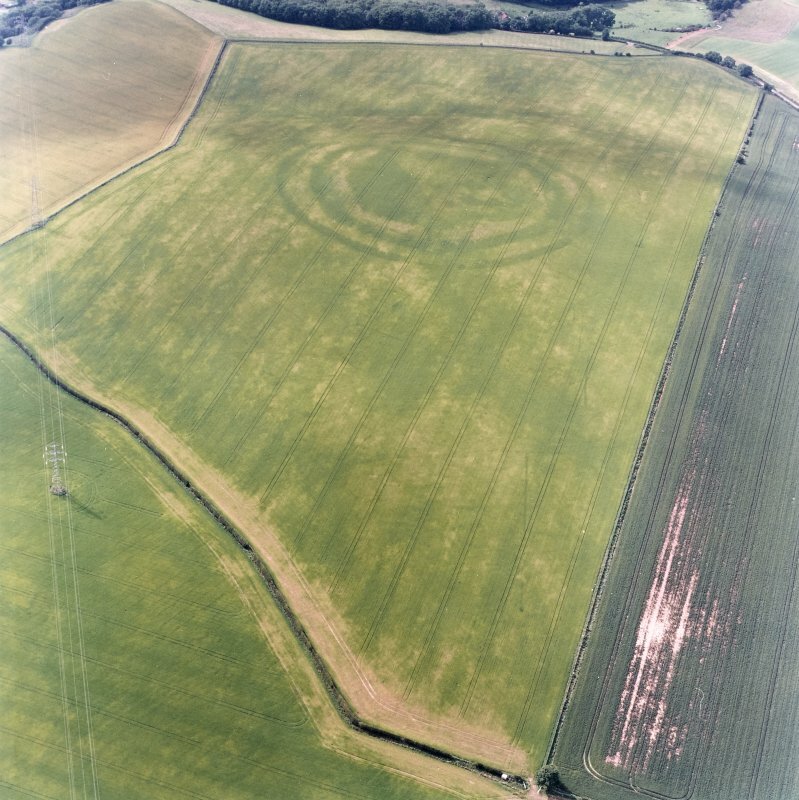 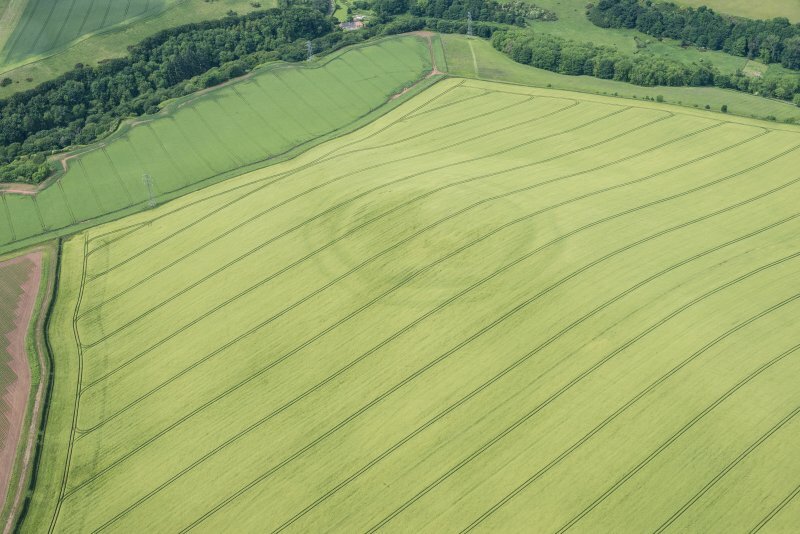 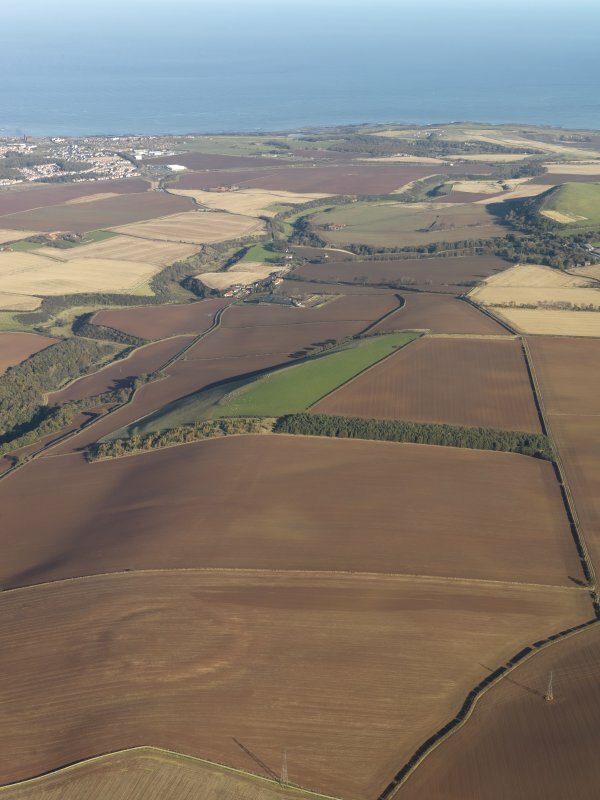 Oblique aerial view centred on the cropmarks of the fort, taken from the SSE. 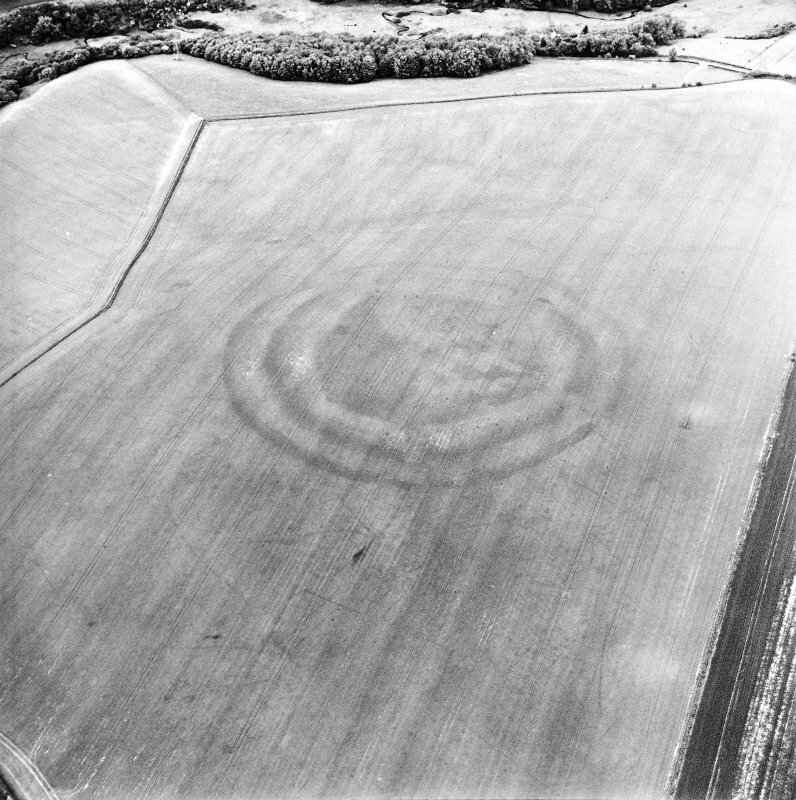 Oblique aerial view centred on the cropmarks of the fort, taken from the E.
Oblique aerial view of the cropmarks of the fort, looking W.
Oblique aerial view centred on the cropmarks of the fort with field boundaries and cropmarks adjacent, taken from the SSE. 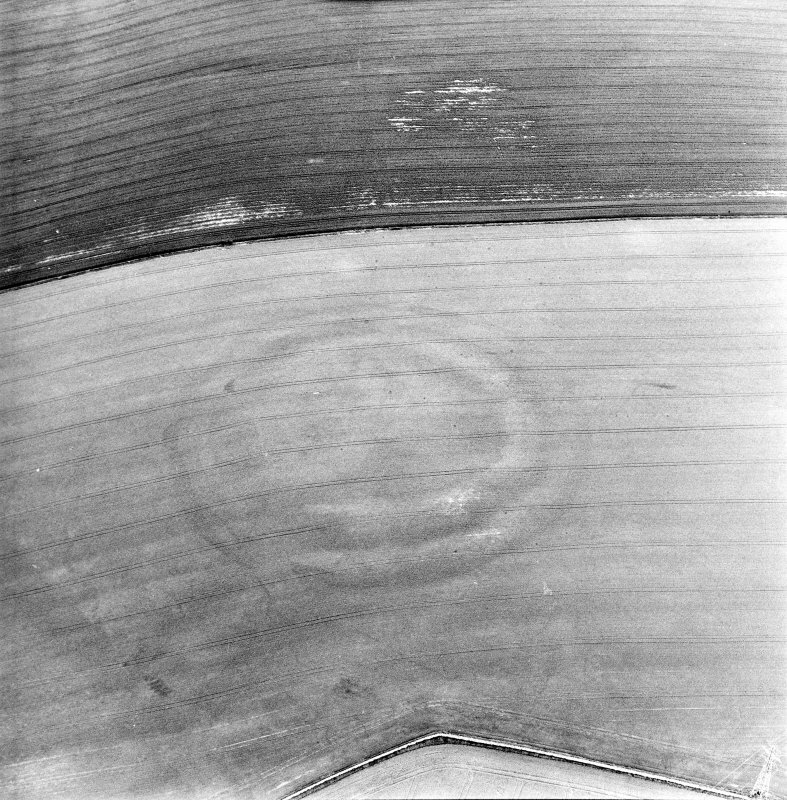 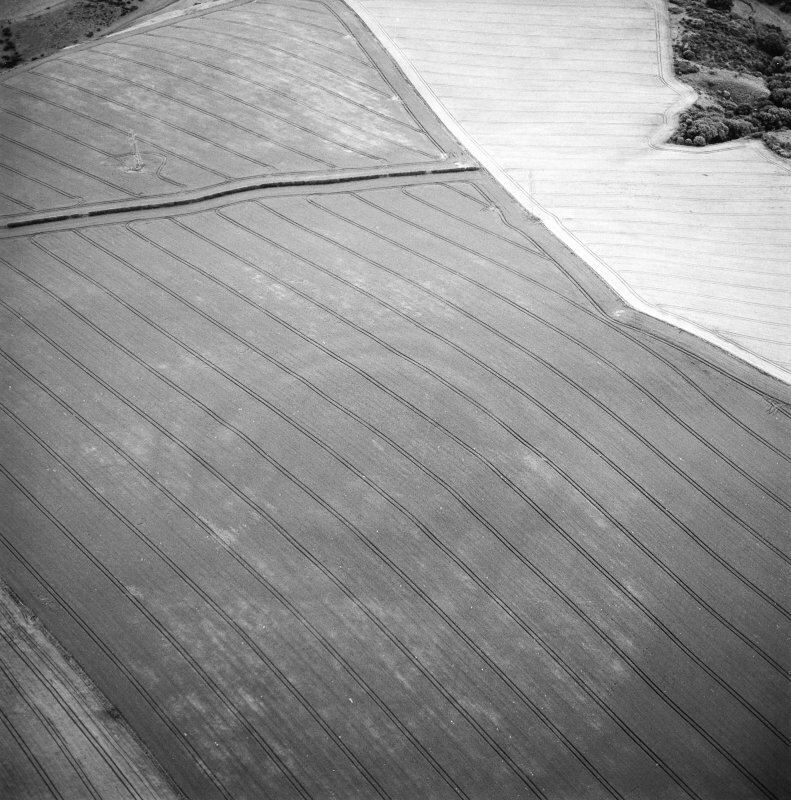 Oblique aerial view centred on the cropmarks of the fort with field boundaries and cropmarks adjacent, taken from the SSW. 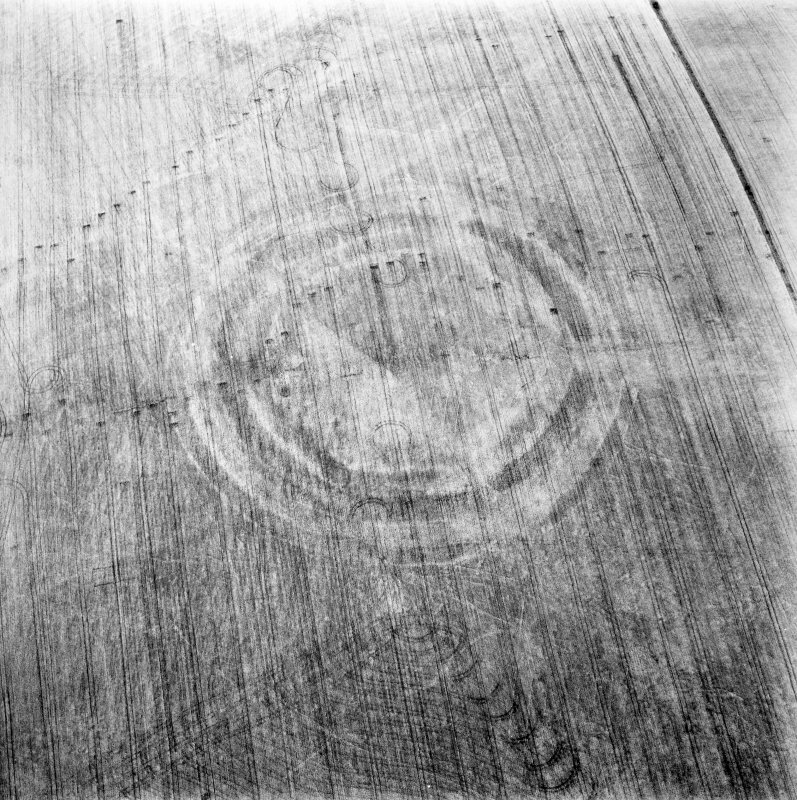 Oblique aerial view centred on the cropmarks of the fort, field boundaries and cropmarks, taken from the ESE. 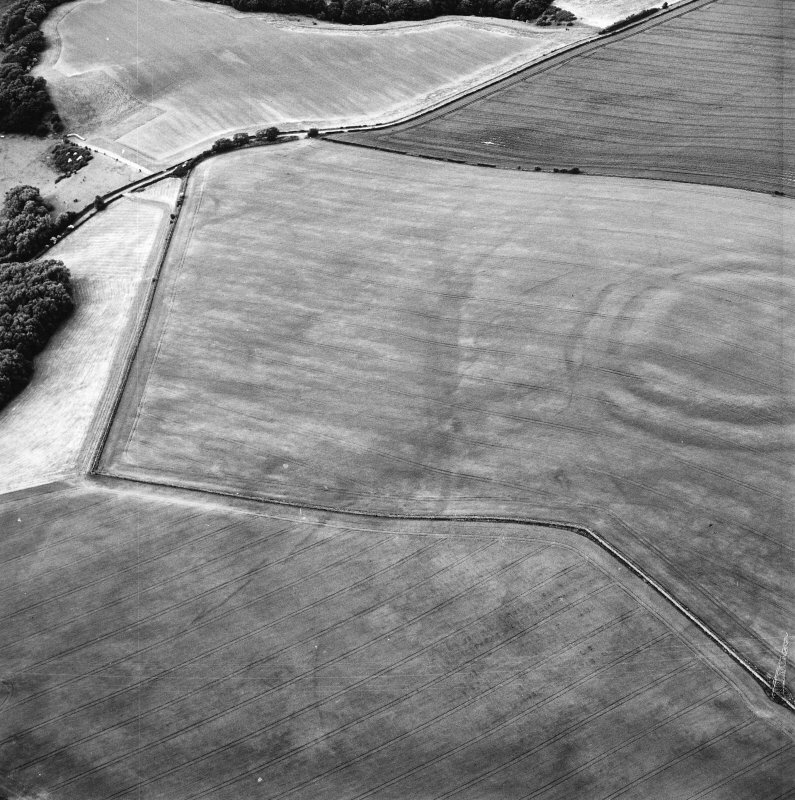 Oblique aerial view centred on the cropmarks of the field boundaries and cropmarks with fort adjacent, taken from the ENE. 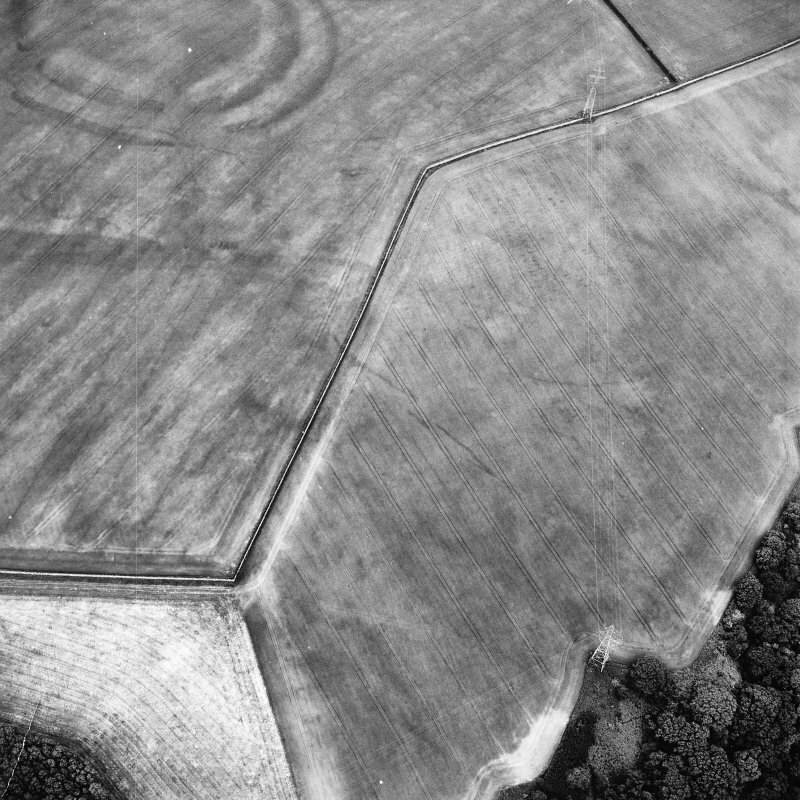 General oblique aerial view of the cropmarks of the fort at The Chesters, Spott, looking NNE. 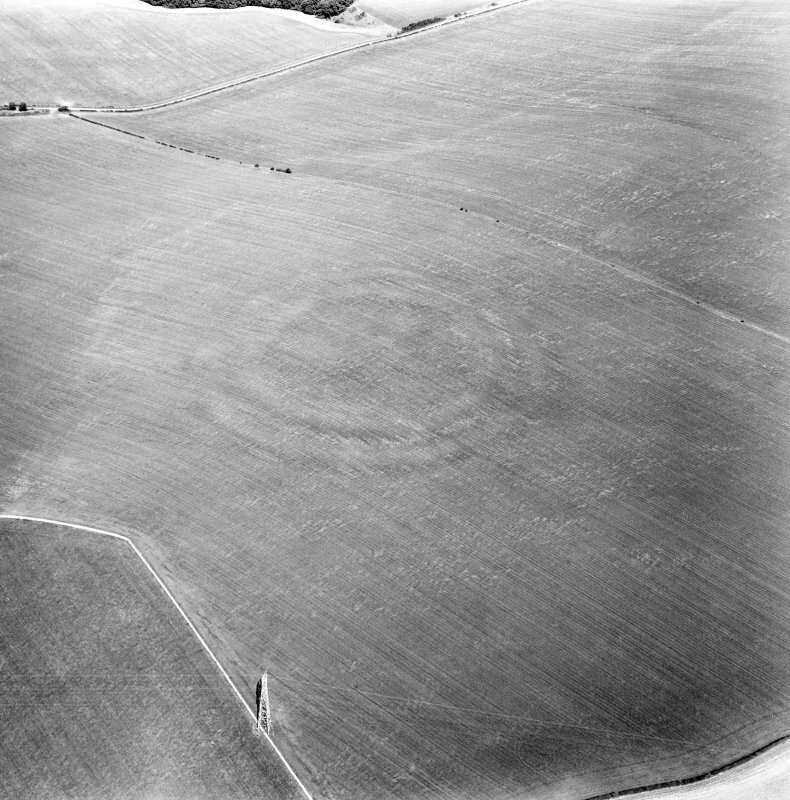 Oblique aerial view centred on the cropmarks of the fort, taken from the SW.
Oblique aerial view centred on the cropmarks of the fort, field boundaries and cropmarks, taken from the SSE. 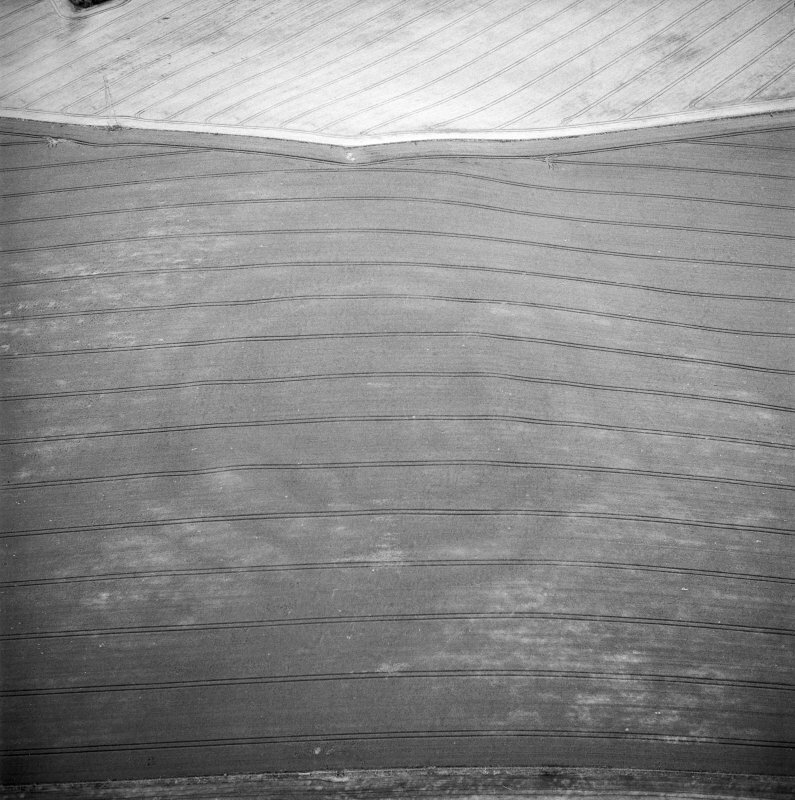 Oblique aerial view centred on the cropmarks of the fort, field boundaries and cropmarks, taken from the NW. 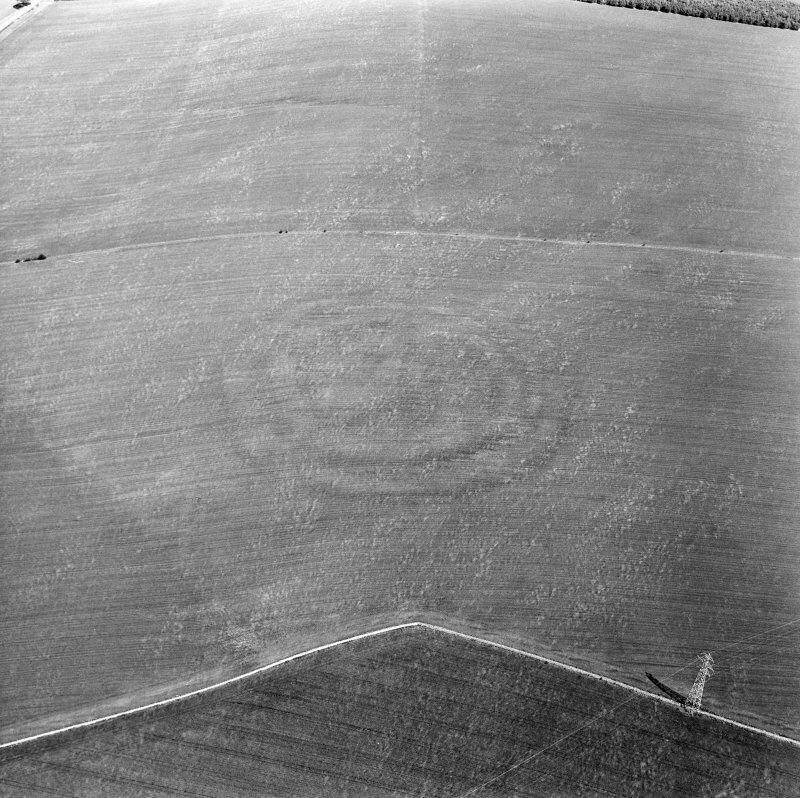 Oblique aerial view centred on the cropmarks of the fort with field boundaries and cropmarks adjacent, taken from the SW.
Oblique aerial view of The Chesters centred on the cropmarks of a fort, taken from the NNE. 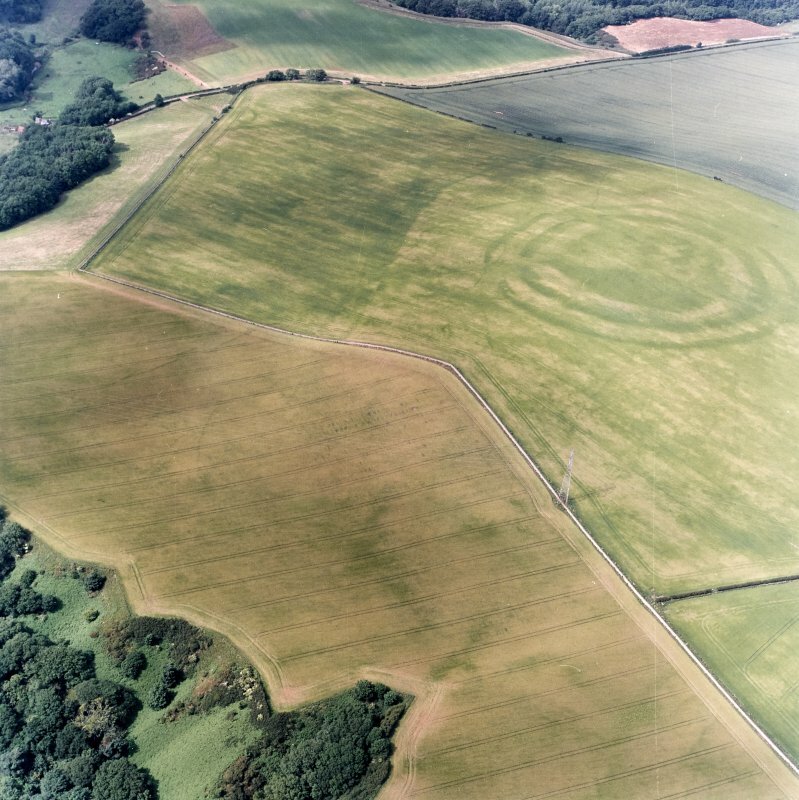 Oblique aerial view centred on the cropmarks of the field boundaries and cropmarks with fort adjacent, taken from the SSE. 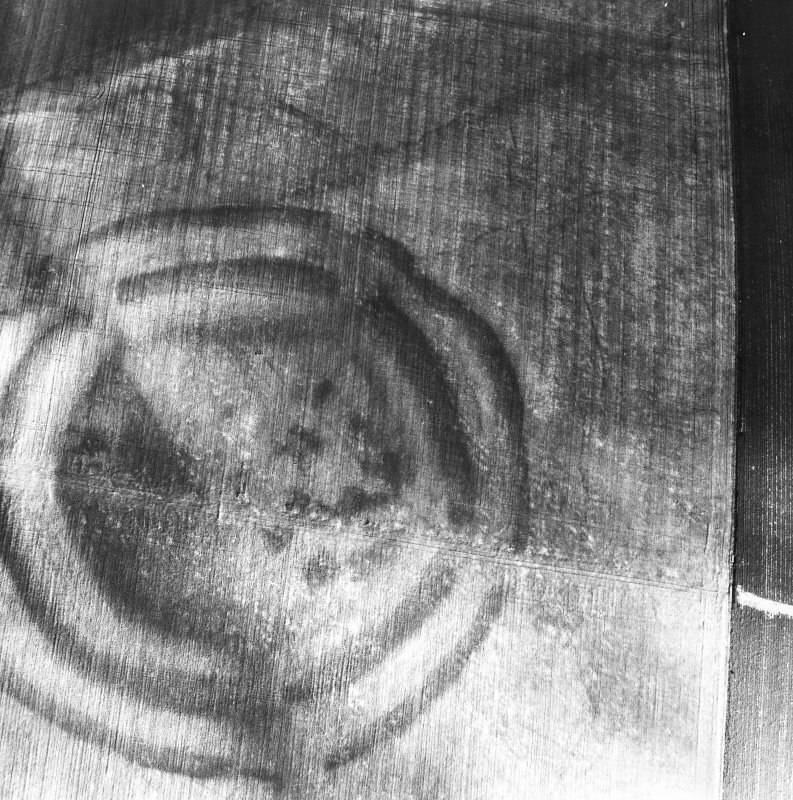 Oblique aerial view centred on the cropmarks of the field boundaries and cropmarks with fort adjacent, taken from the S.
Oblique aerial view centred on the cropmarks of the fort with field boundaries and cropmarks adjacent, taken from the SE. 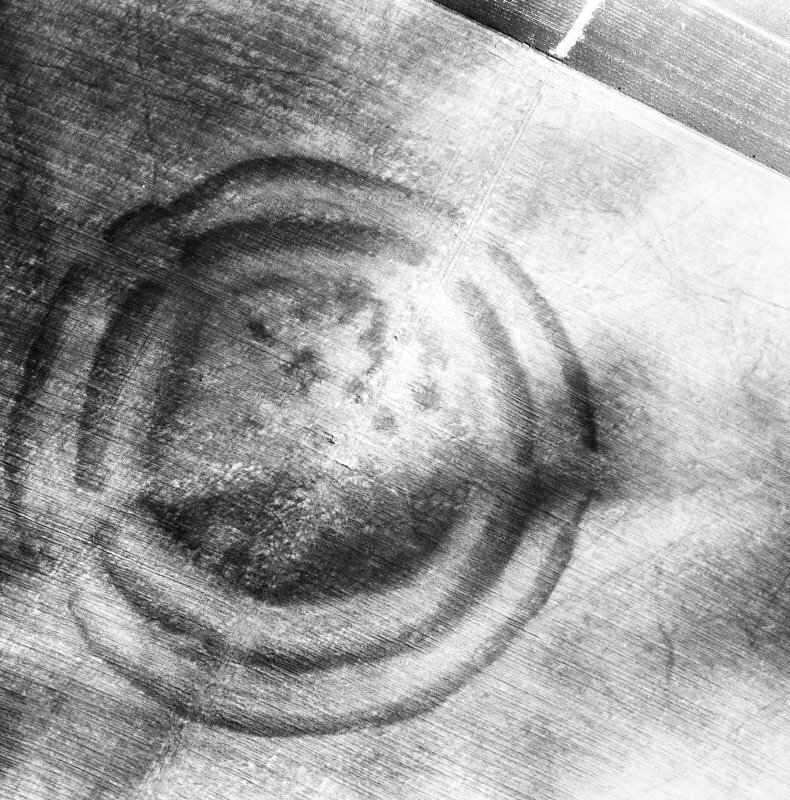 Oblique aerial view centred on the cropmarks of the fort with field boundaries and cropmarks adjacent, taken from the W.
Oblique aerial view centred on the cropmarks of the fort, field boundaries and cropmarks, taken from the S.
Oblique aerial view centred on the cropmarks of the fort with field boundaries and cropmarks adjacent, taken from the NE. 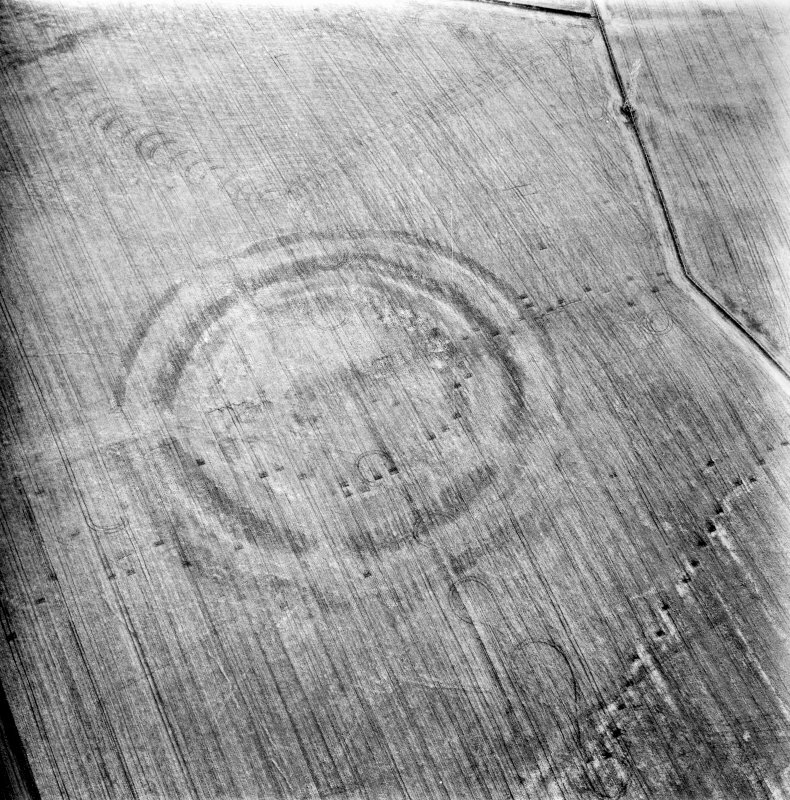 Oblique aerial view centred on the cropmarks of the field boundaries and cropmarks with fort adjacent, taken from the WSW. 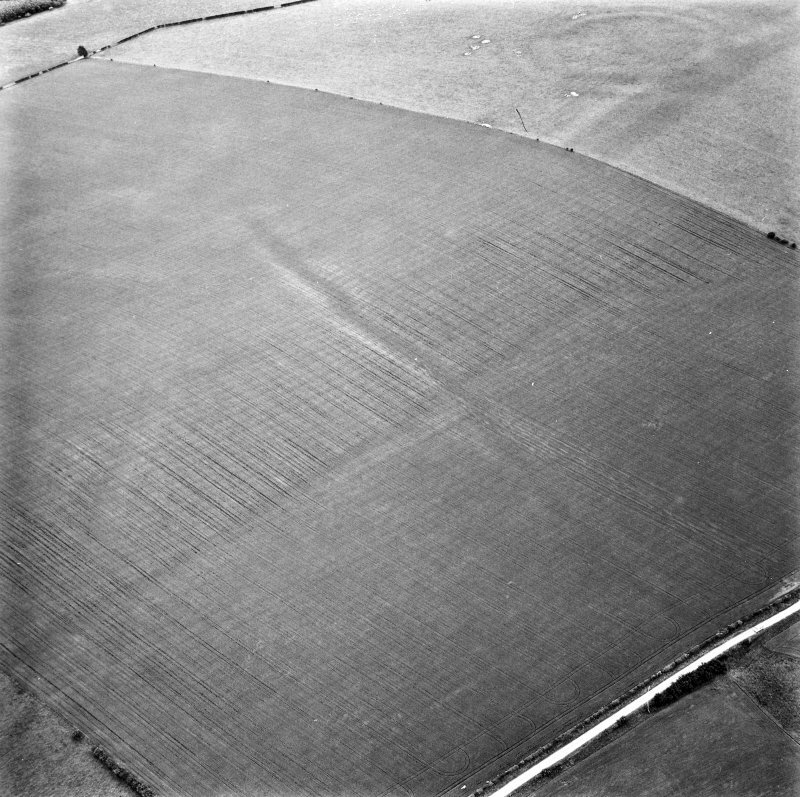 Oblique aerial view of the cropmarks of the fort and field boundaries, looking E.
Oblique aerial view of the cropmarks of the fort and field boundaries, looking SE. 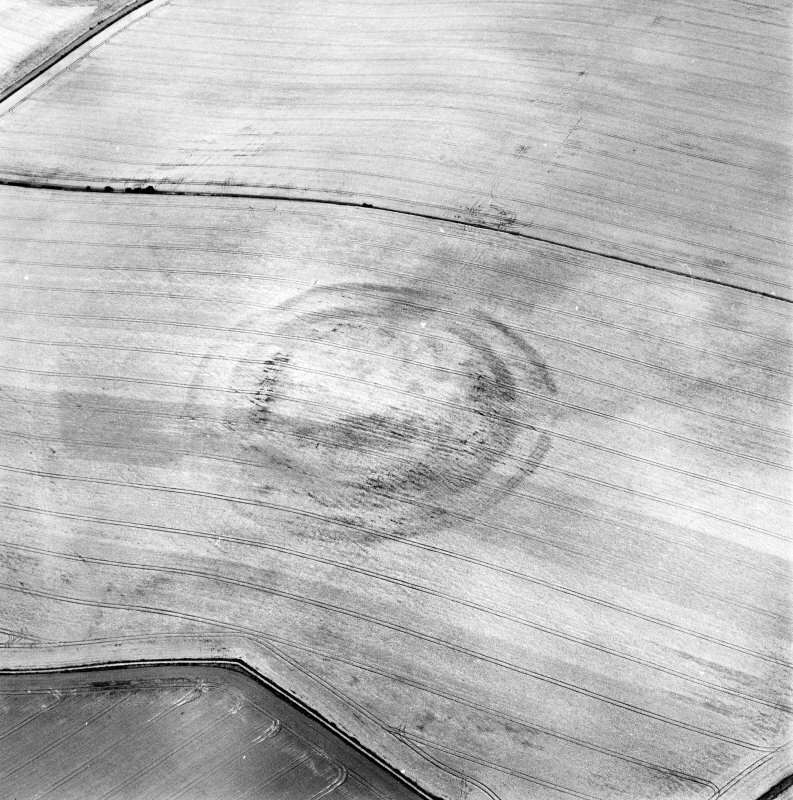 General oblique aerial view of the soilmarks of the fort of The Chesters, Spott, taken from the SW.
Oblique aerial view centred on the cropmarks of the field boundaries and cropmarks with fort adjacent, taken from the W.
Oblique aerial view centred on the cropmarks of the fort, taken from the N.
Oblique aerial view centred on the cropmarks of the fort, field boundaries and cropmarks, taken from the SE. 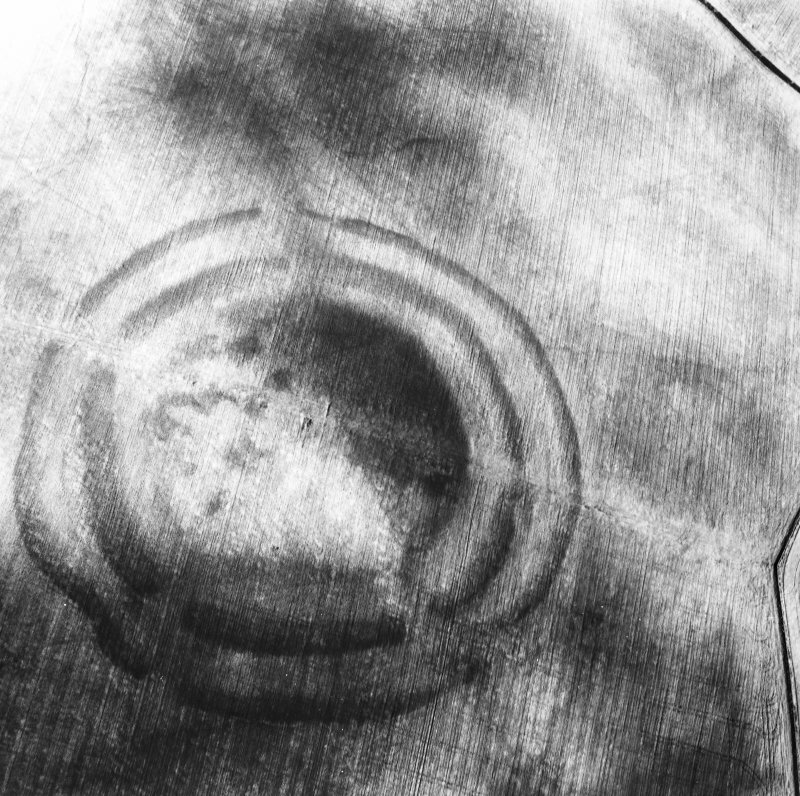 Oblique aerial view centred on the cropmarks of the fort with field boundaries and cropmarks adjacent, taken from the WSW. 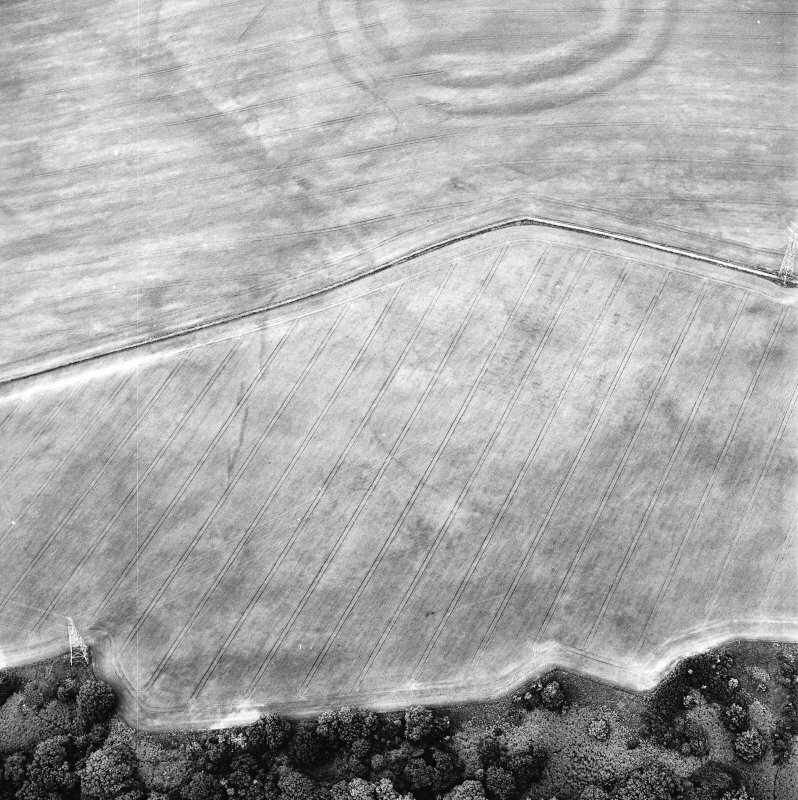 Oblique aerial view of The Chesters centred on the cropmarks of a fort, taken from the N.
Oblique aerial view of The Chesters centred on the cropmarks of a fort, taken from the NE. 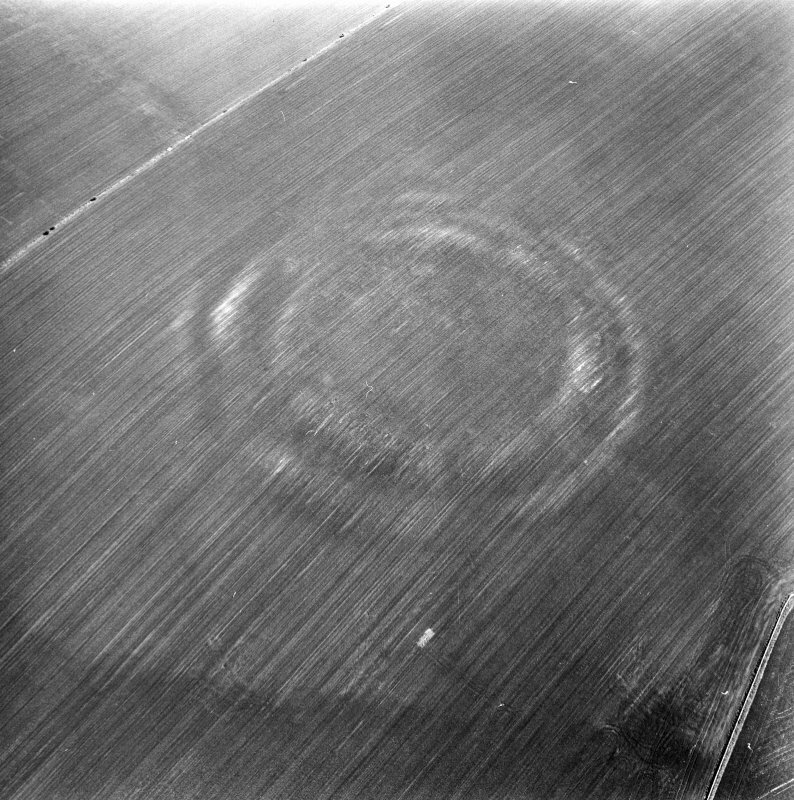 Oblique aerial view of the cropmarks of the fort, looking NW. 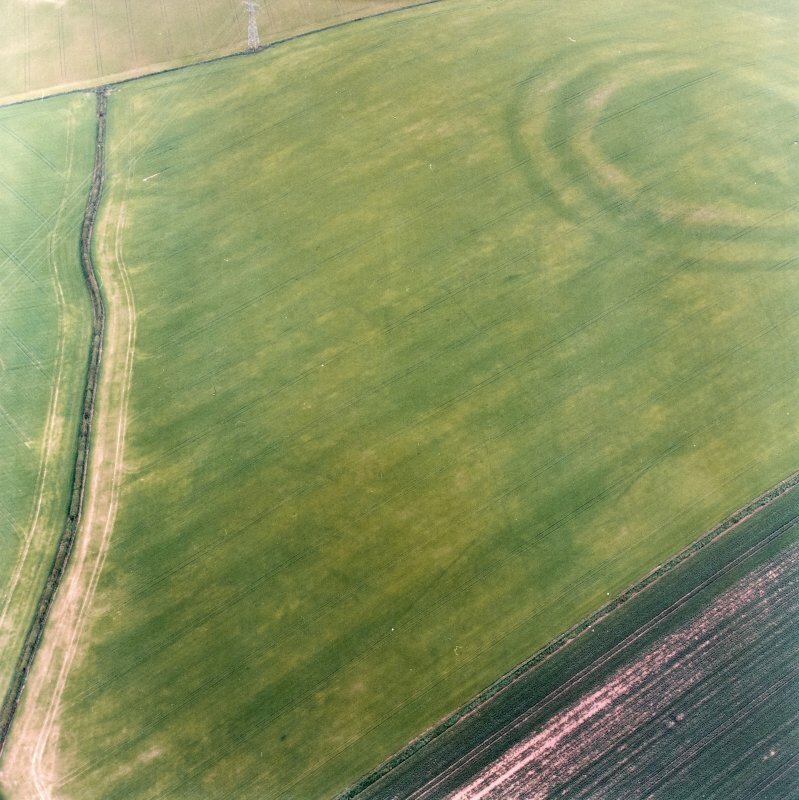 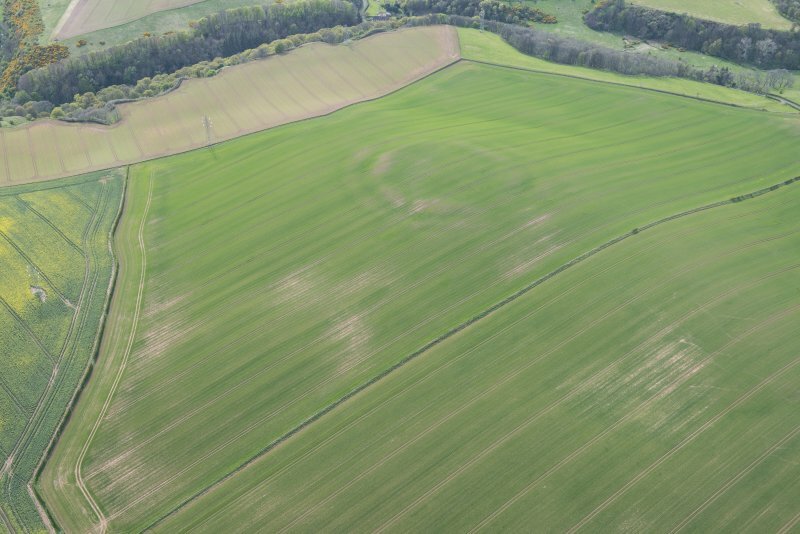 Oblique aerial view of the cropmarks of the fort at The Chesters, Spott, looking SW.
Fort, The Chesters: A large example of a circular bivallate fort, ploughed down and robbed of any stonework which may have existed, but still impressive. 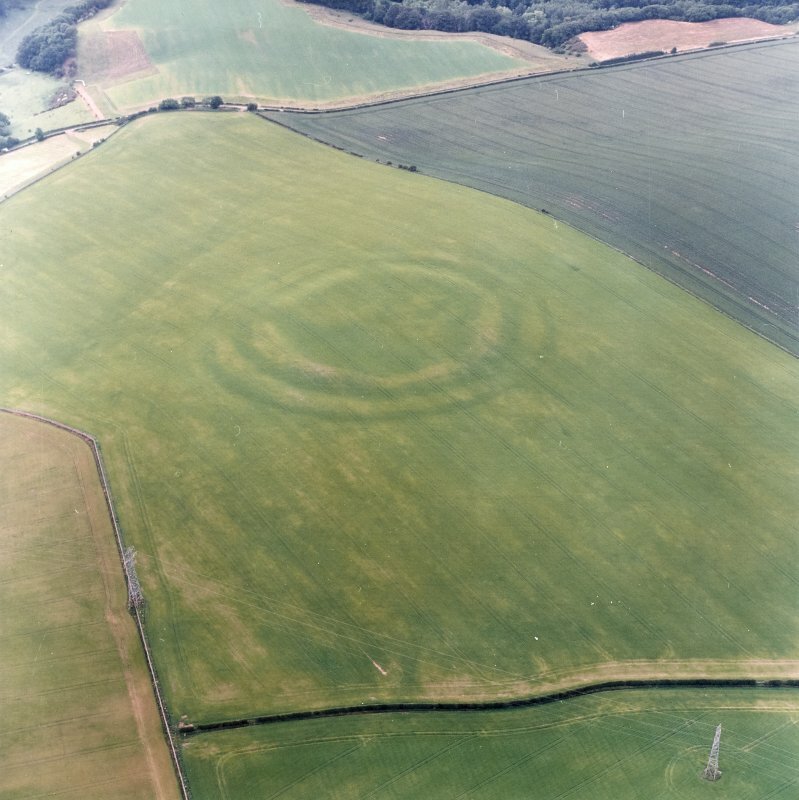 It measures about 350ft in diameter within two massive ramparts with external ditches. 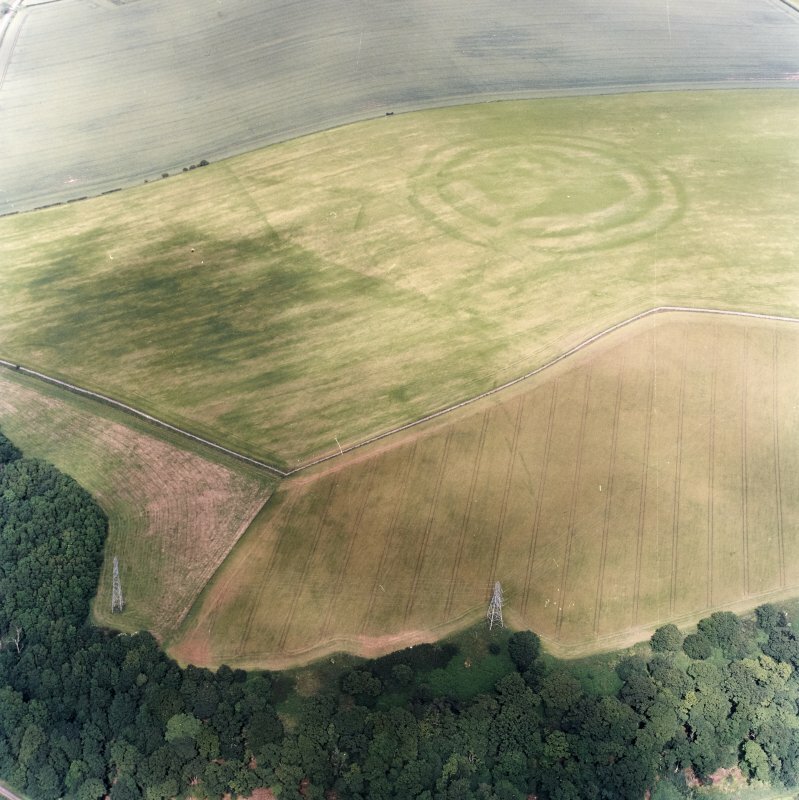 The inner rampart is now spread to a width of as much as 60ft but is still 7ft high, while the outer is 45ft wide and 5ft high. 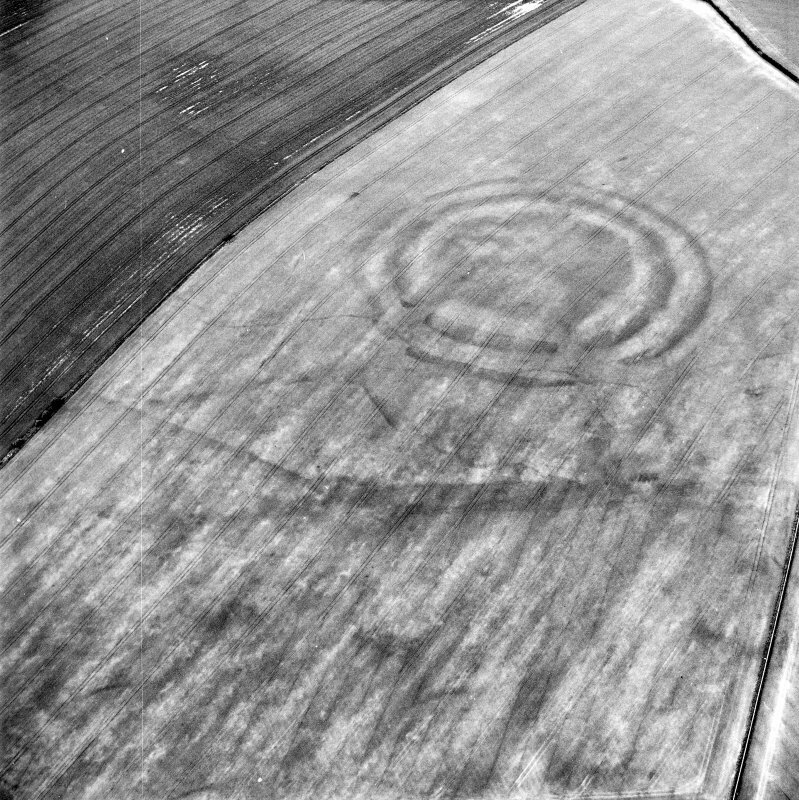 The original entrance is in the ESE, and another in the W may also be authentic. 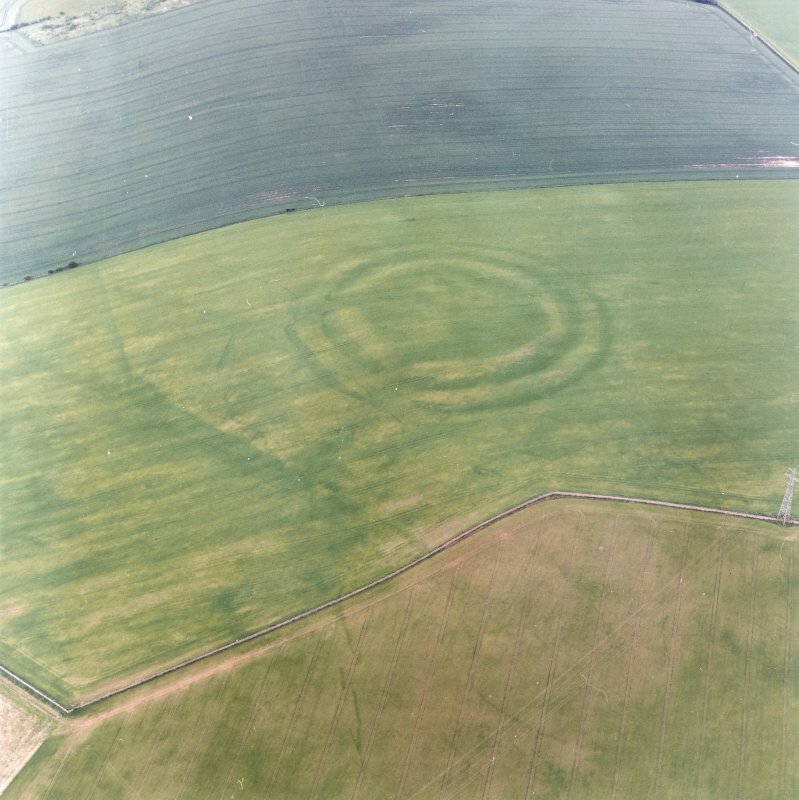 This fort is generally as described by Feachem. 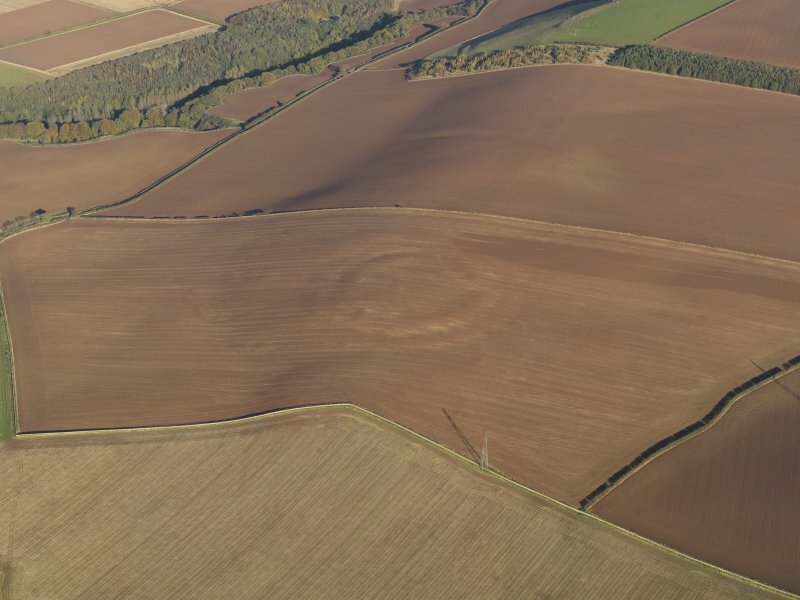 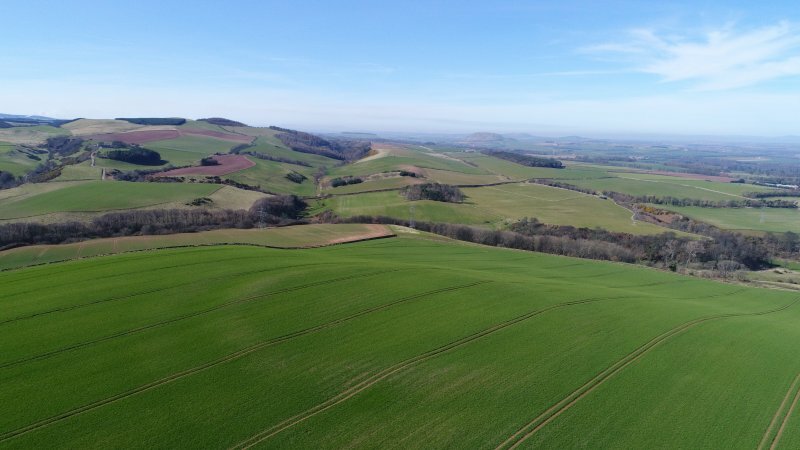 The outer ditch has to all intents and purposes been ploughed out, while the massive inner rampart has been reduced to a stony scarp except in the SE sector. 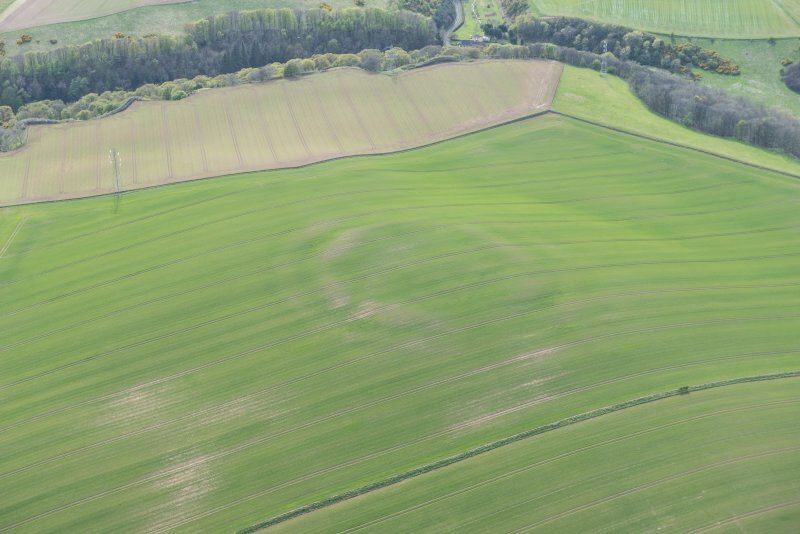 No definite entrance could be located, the most likely place for it being in the NE sector. 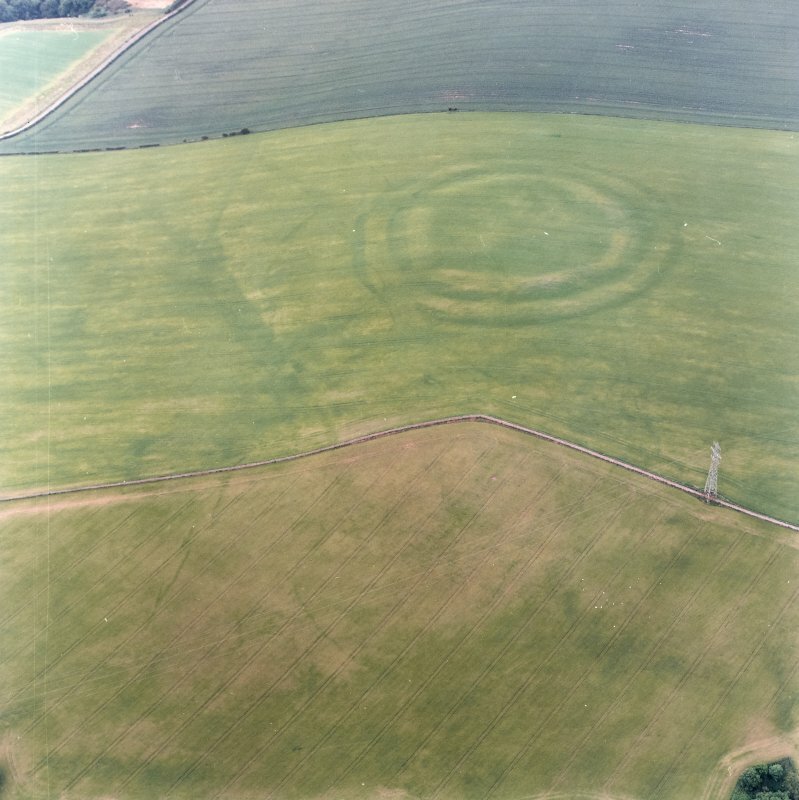 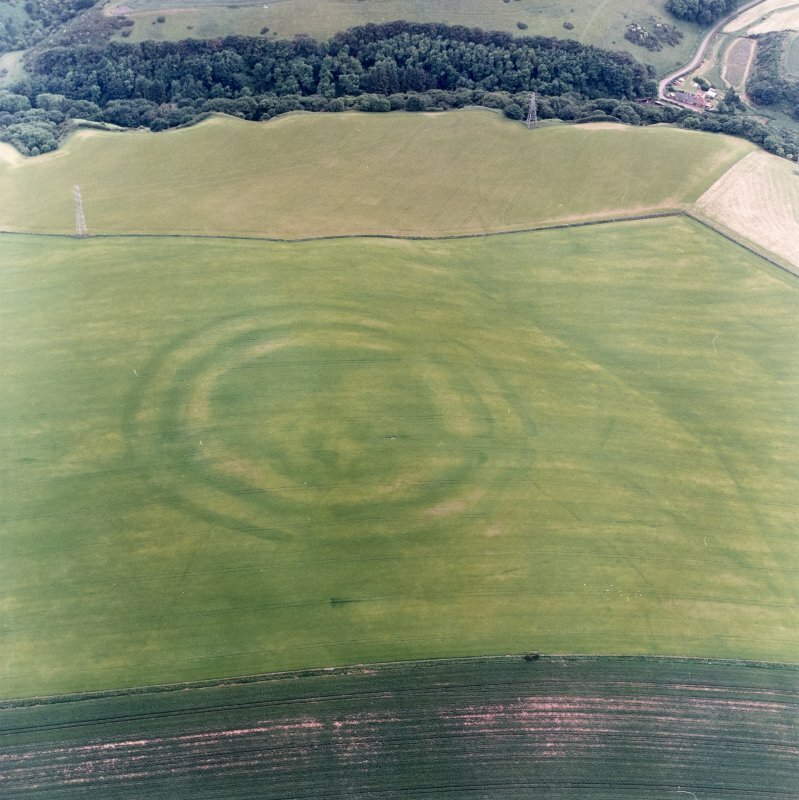 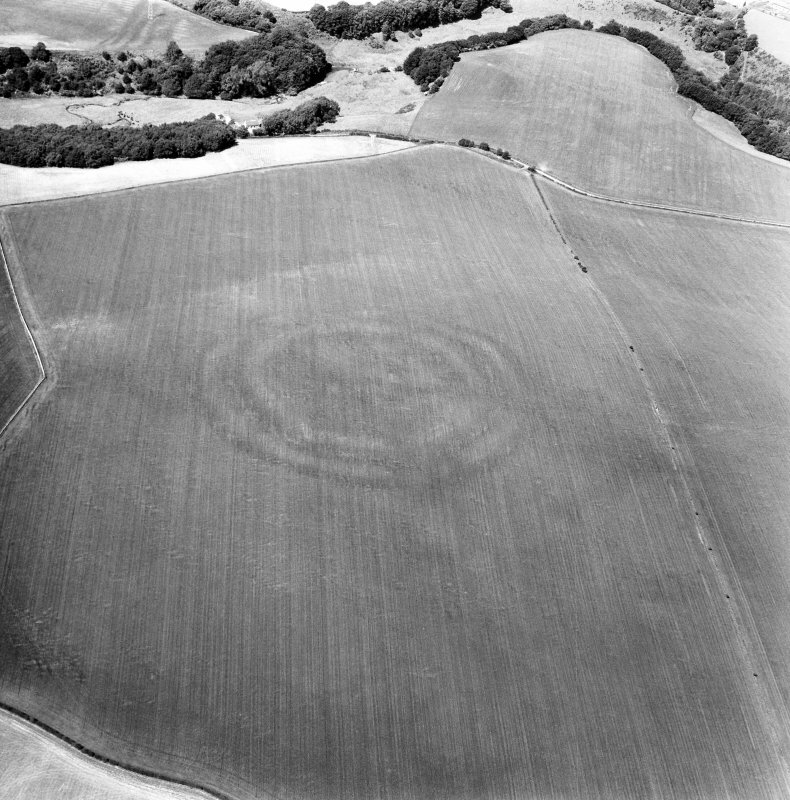 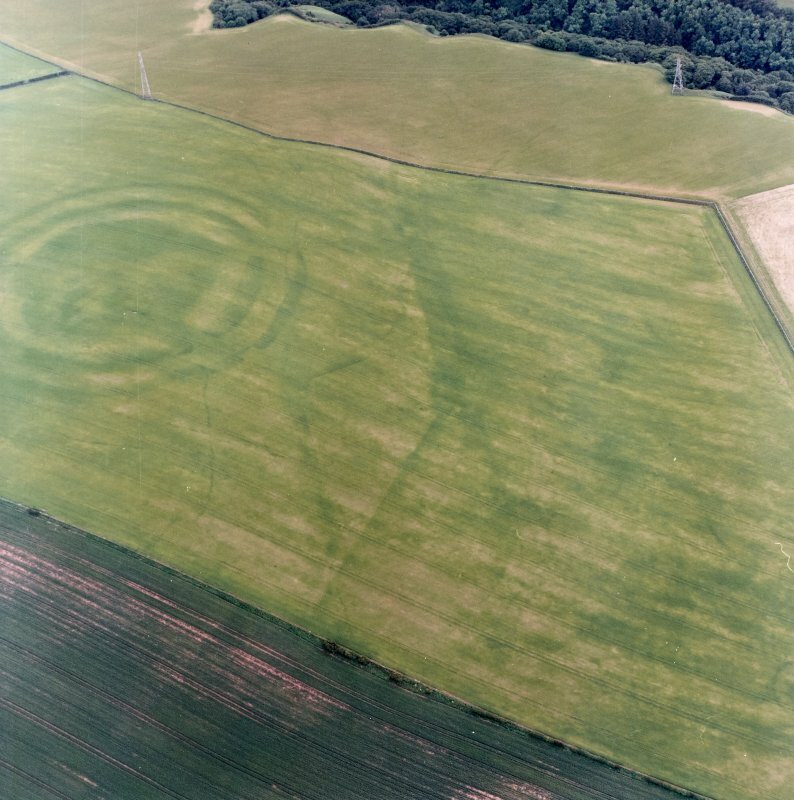 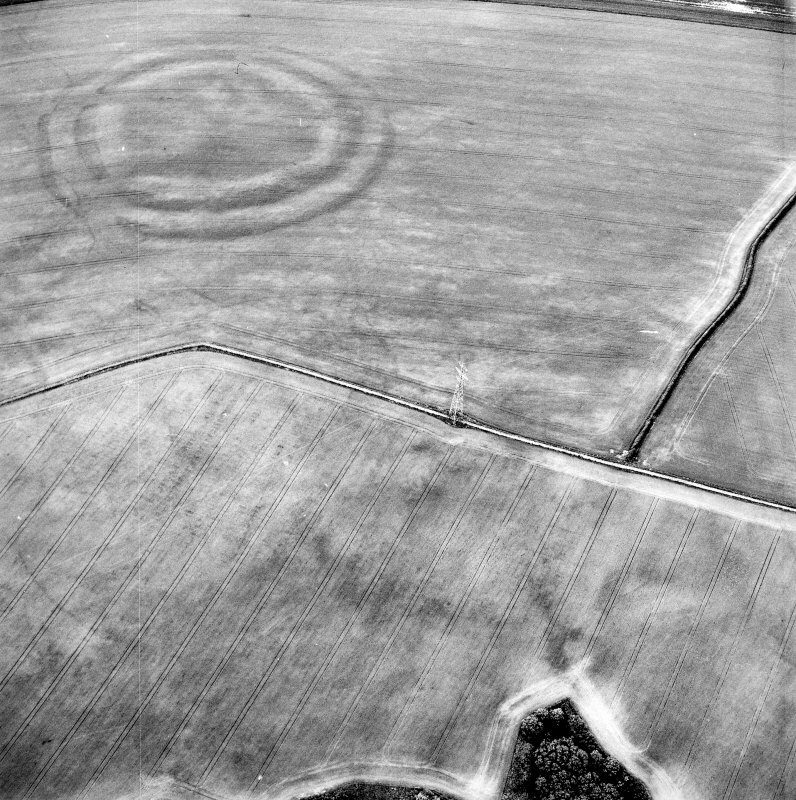 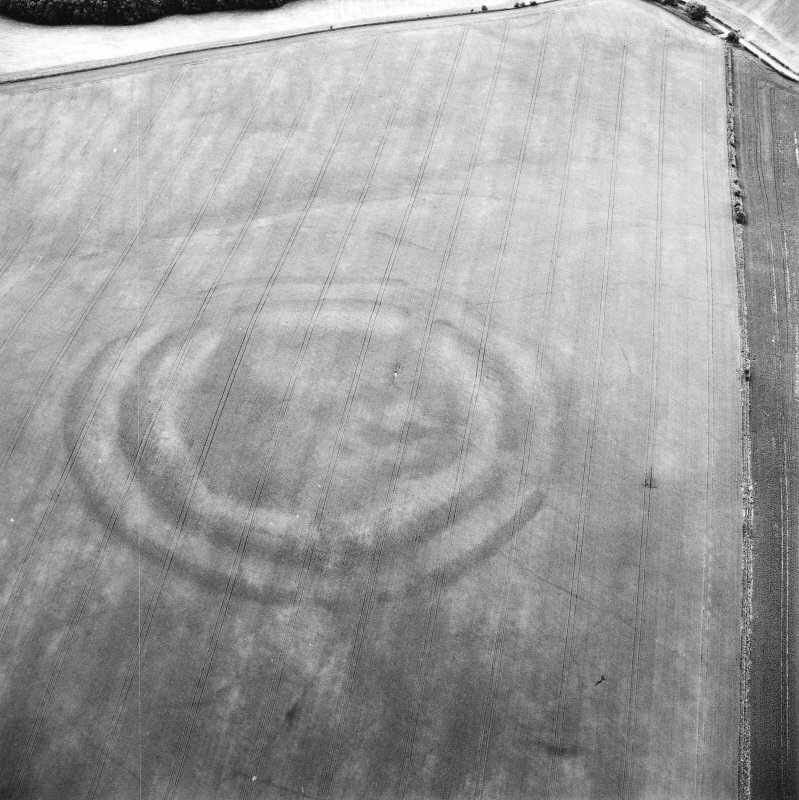 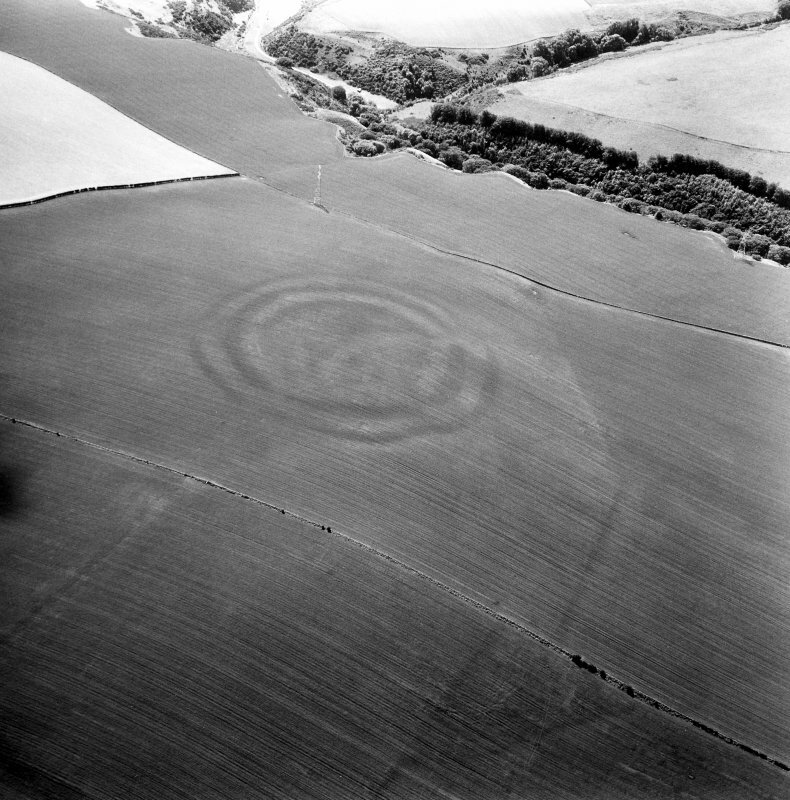 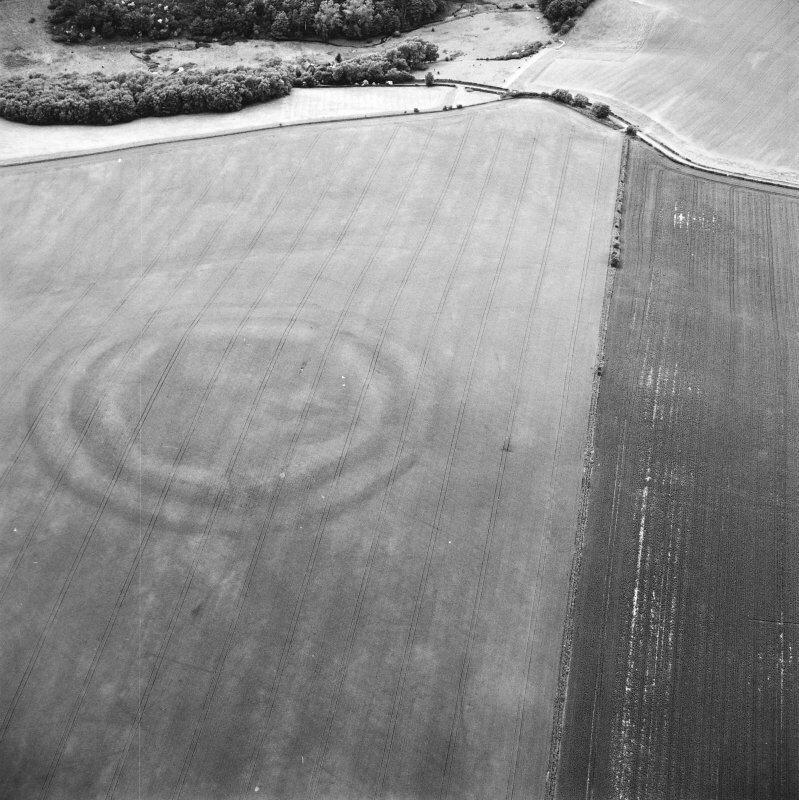 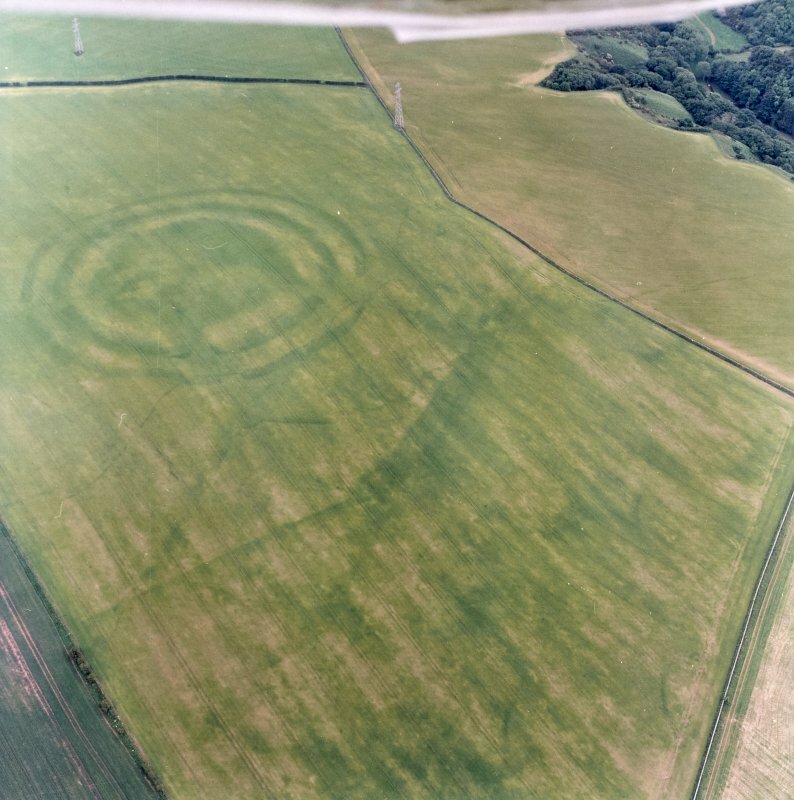 Additional aerial photographs taken in 1980 by RCAHMS and also visible on vertical air photographs, (OS 73/123/75-6, flown 1973). 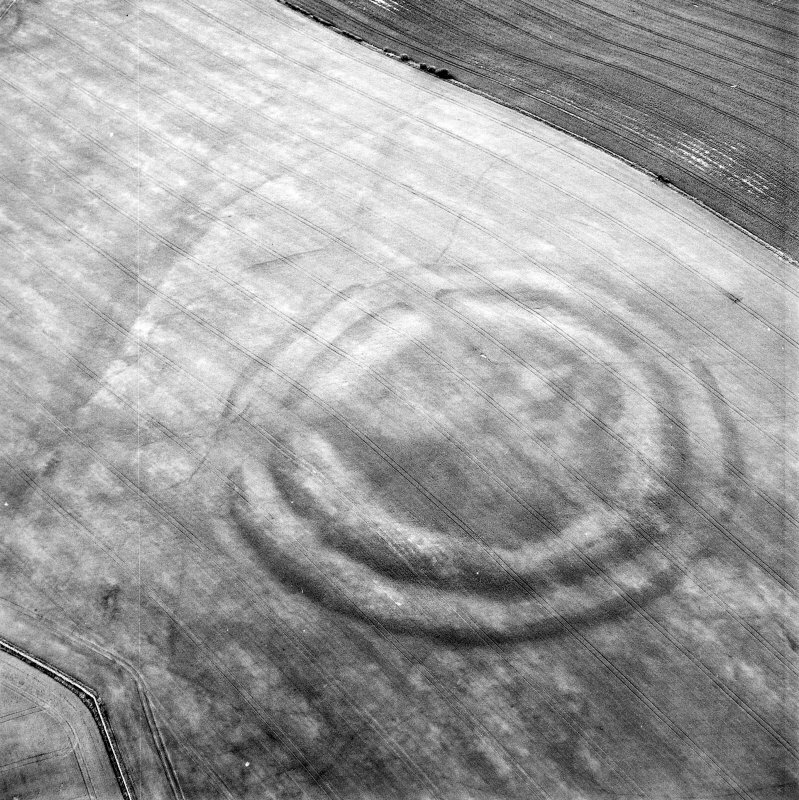 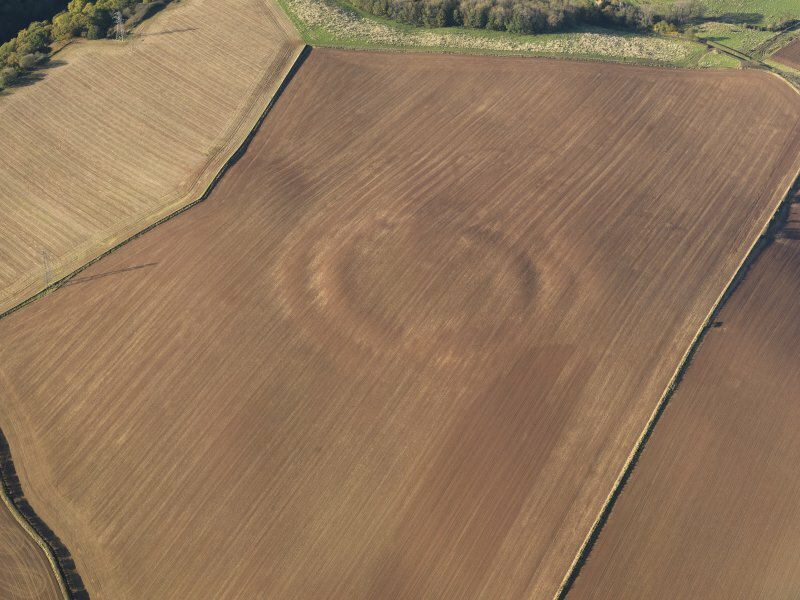 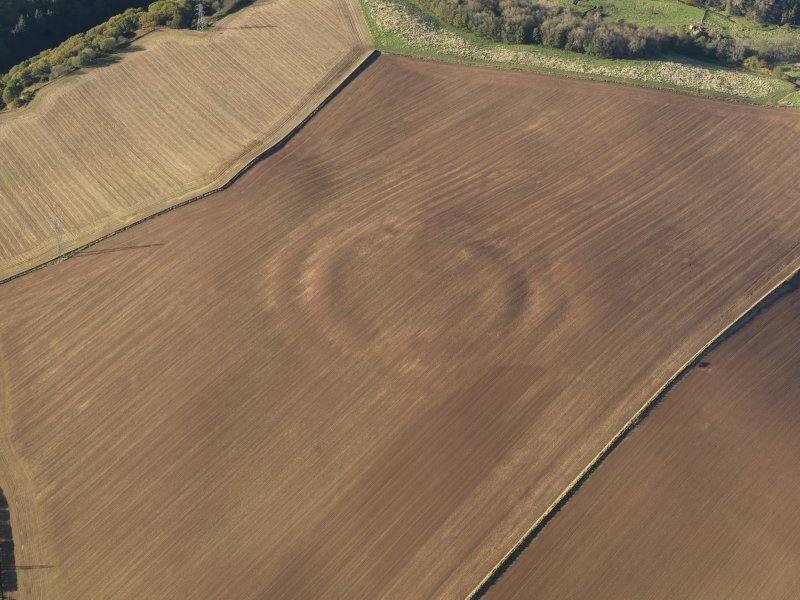 This fort, which is situated on the NW shoulder of the rounded hill above Spott Mill, is heavily ploughed down, but the massive ramparts are still plainly visible, forming broad undulations in the surface of the field, and the ditches have produced strong cropmarks in numerous years of aerial reconnaissance. 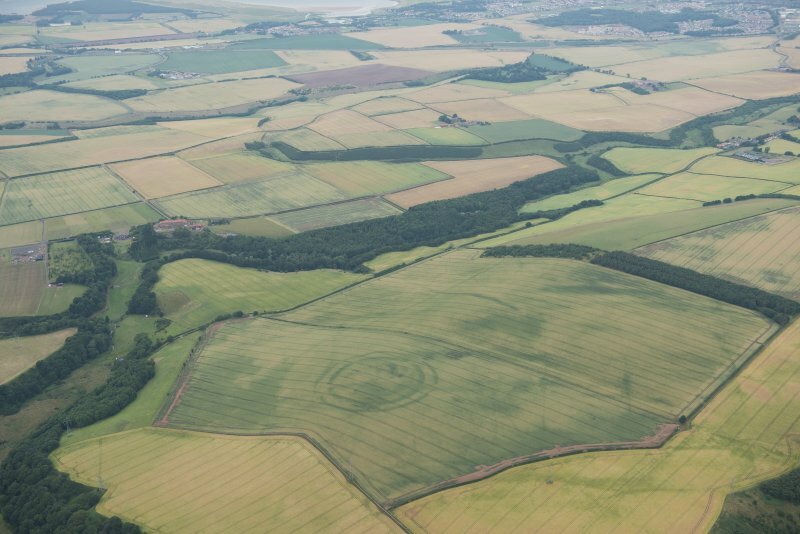 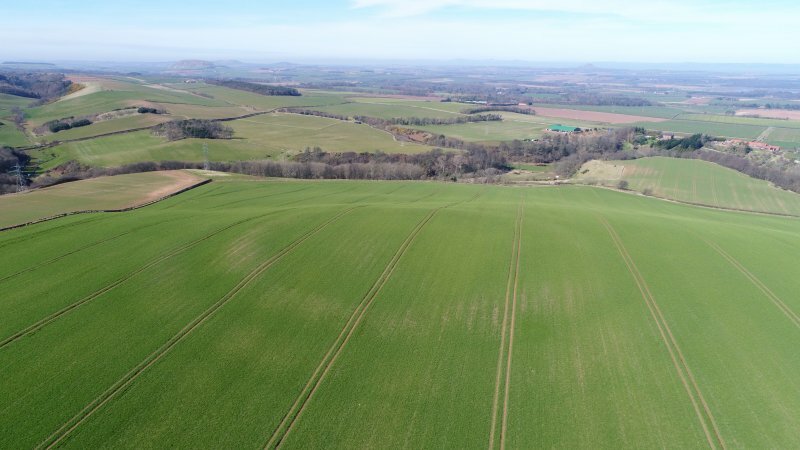 Roughly circular on plan, it measures 110m from NE to SW by 105m transversely (0.89ha) within two ramparts with external ditches. 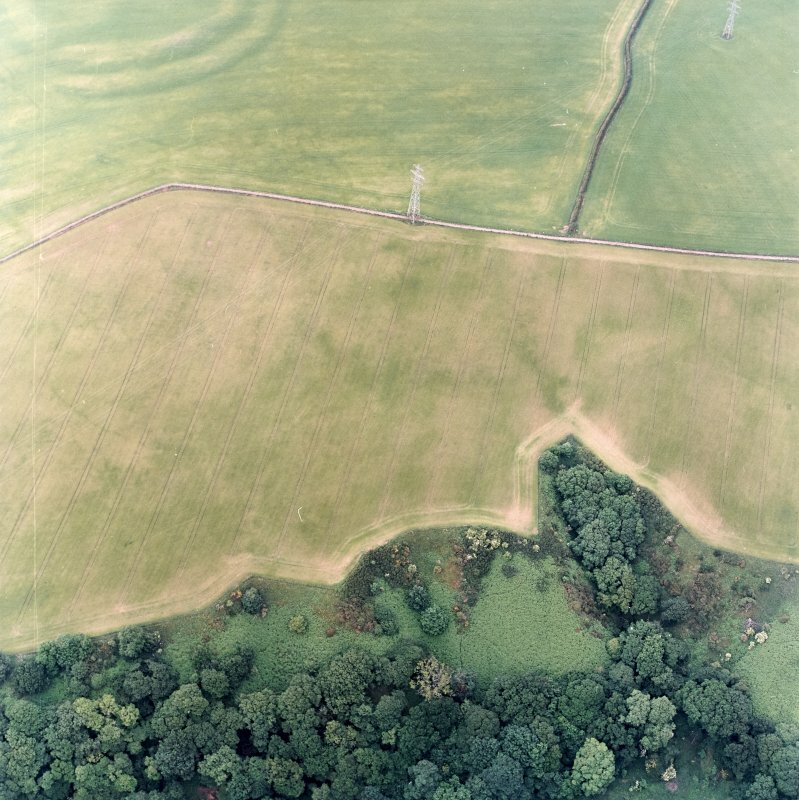 The gap between the inner ditch and the traces of an internal quarry scoop indicate that the that the inner rampart was in the order of 10m thick, while the inner and outer ditches are 10m and 7m broad respectively. 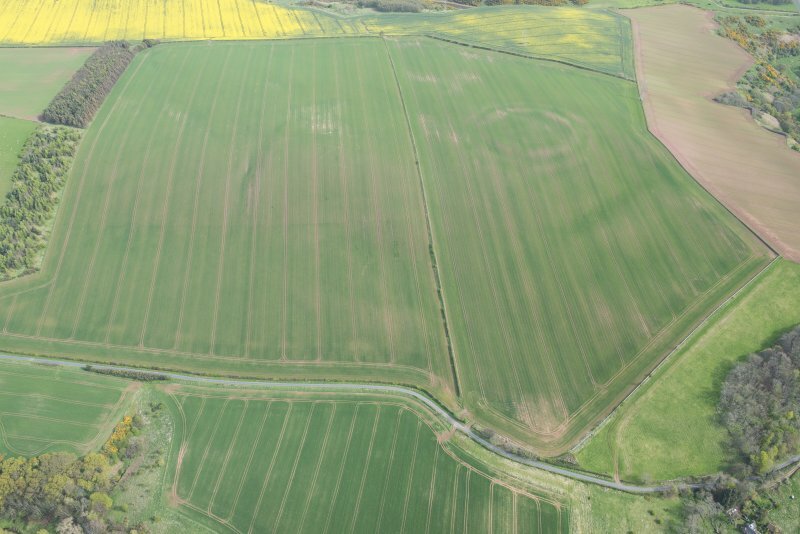 Taken together the defences would have formed an impressive belt in excess of 40m deep, pierced by entrances on the NE, SE, WSW and NNW respectively. 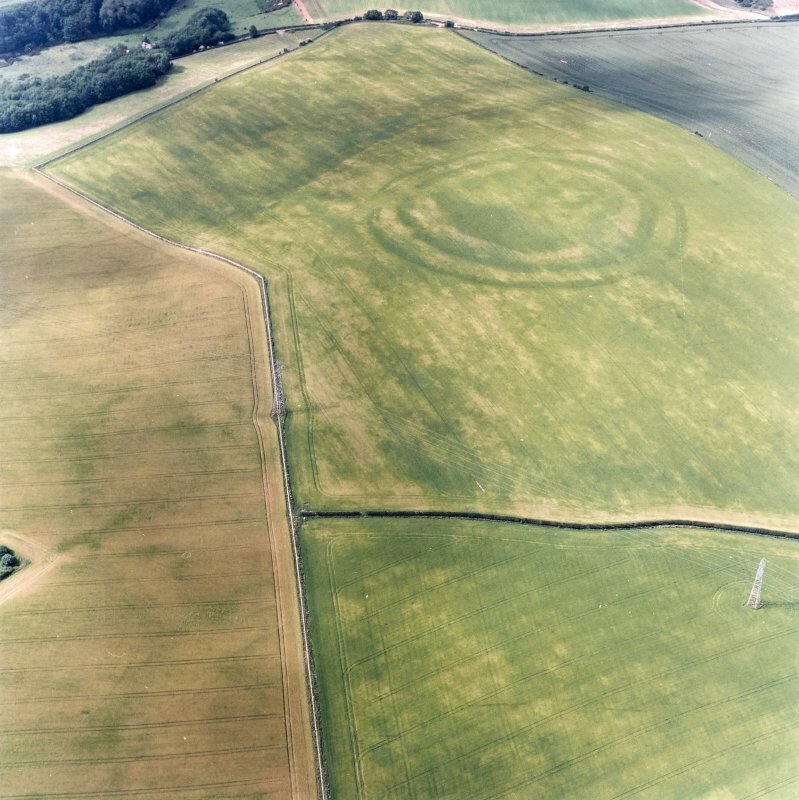 Of the latter, that on the NE is a simple gap, as may have been the SE entrance too, except that a tongue of ditch projecting from the S terminal of the outer ditch, which in itself is possibly evidence of a recut phase, closes down the outer gap to create an oblique approach exposing the visitor's right side. 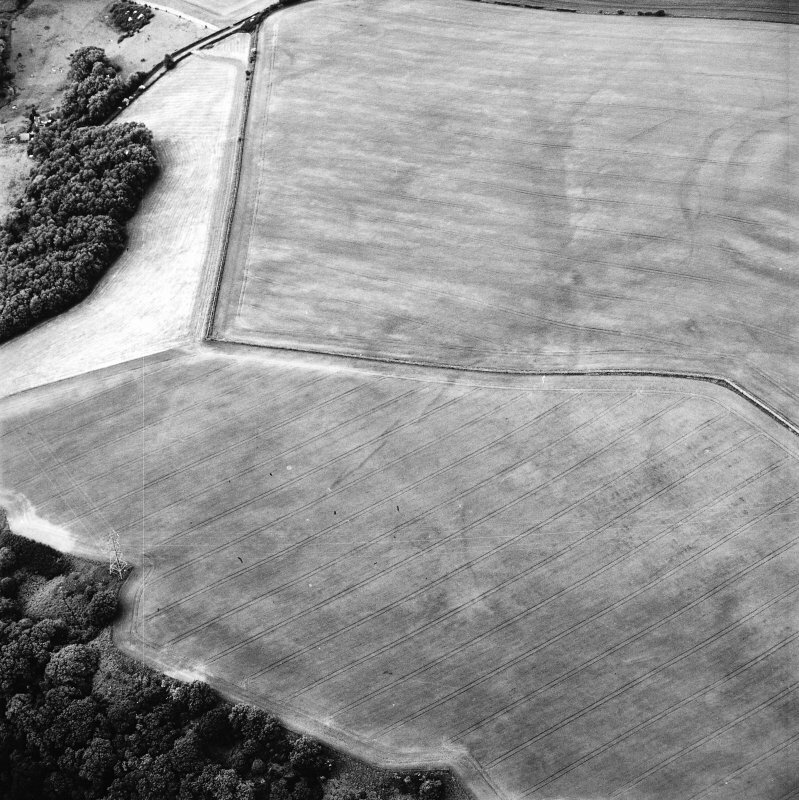 The entrance ways of the other two entrances are also angled to expose the visitors right side, but the gaps in the outer ditch have been elaborated in slightly different ways, on the NNW by doglegging the E terminal outwards in front of the inner gap, and on the WSW by turning the S terminal inwards, inside the line of the N terminal, thus creating an overlap. 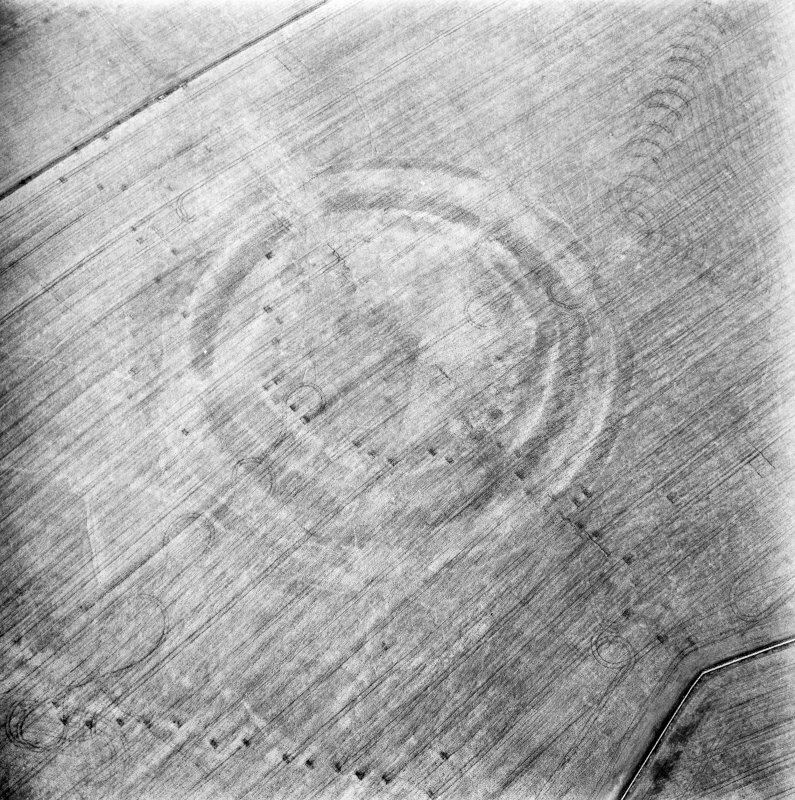 There are several maculae visible on the aerial photographs within the interior, but none resolves into a clear structure. 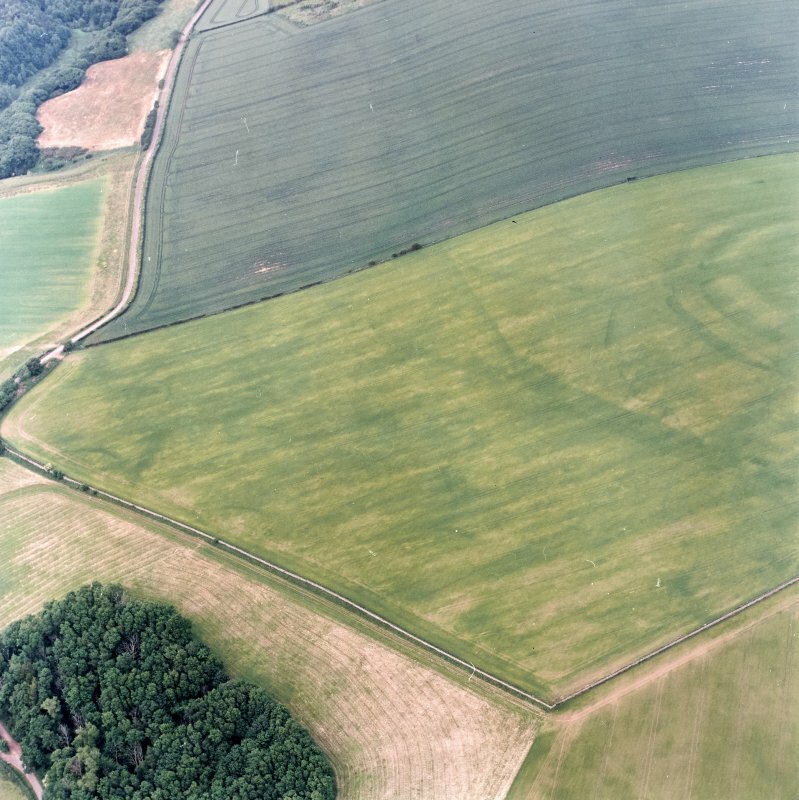 More importantly, the presence of the internal quarry scoop and the massive broad spread of the inner rampart has almost certainly created relatively deep deposits of sediment, particularly in the S half of the interior, that are likely to preserve stratified evidence of occupation.